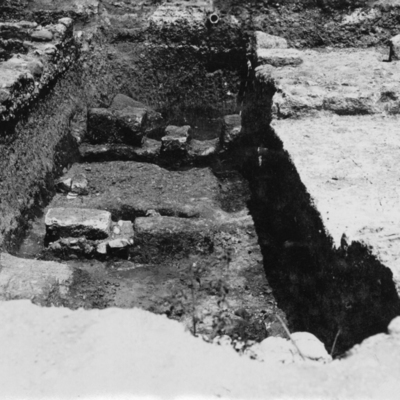 General view of excavations along outer wall of the Circus. 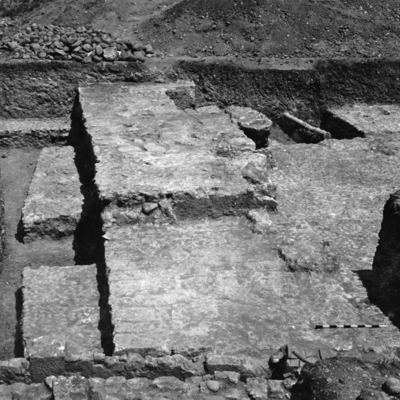 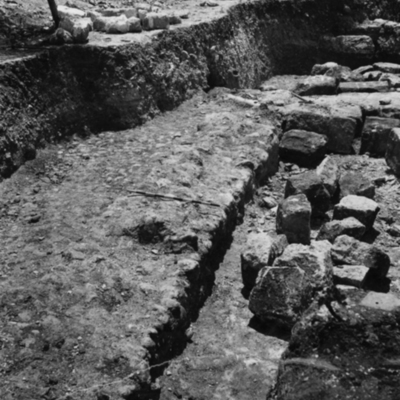 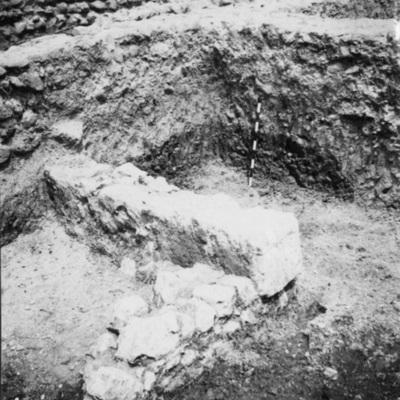 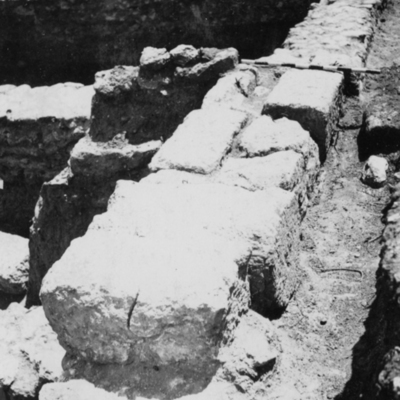 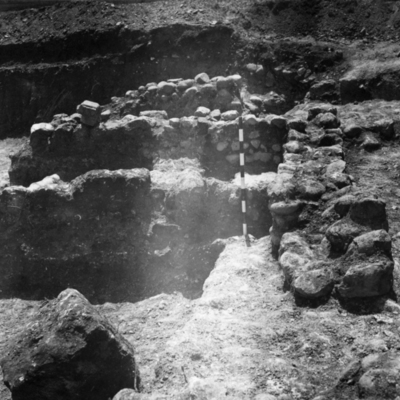 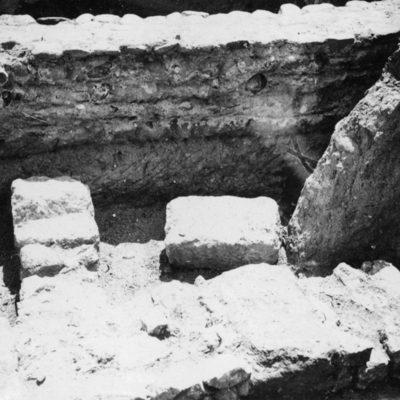 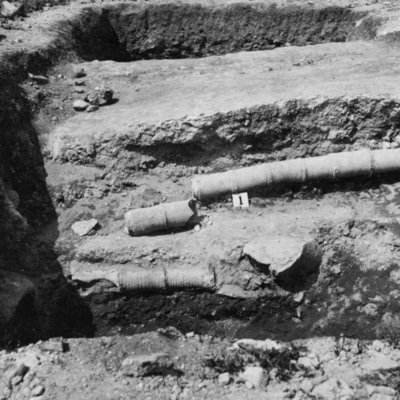 Detail view of excavations along outer wall of the Circus. 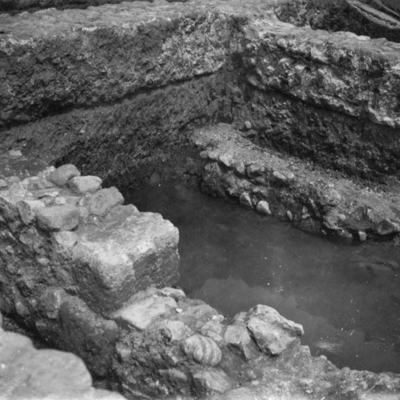 Excavations at northeast turn of the Circus. 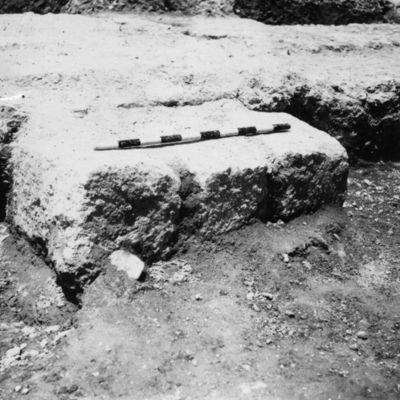 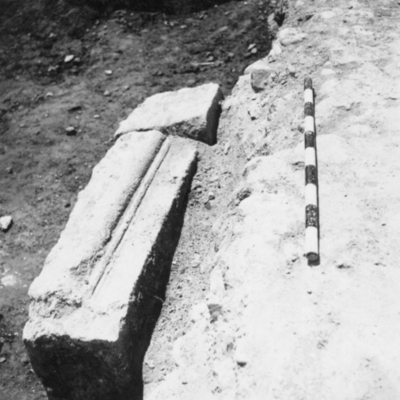 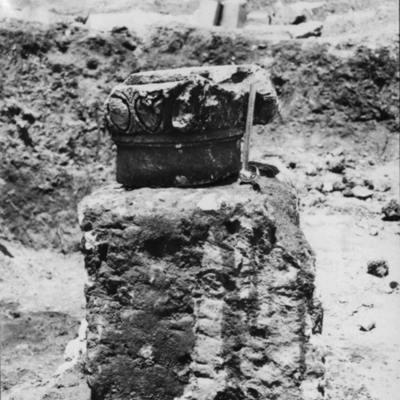 Block of masonry with bronze dowel in the Porta Triumphalis. 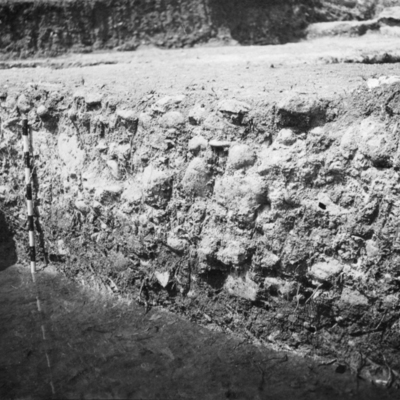 Southeast trench detail of outer foundation wall. 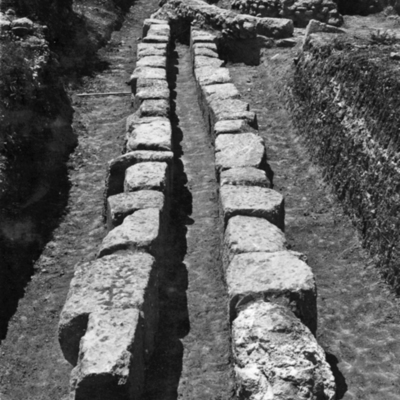 Detail of east roadway pier blocks in Porta Triumphalis. 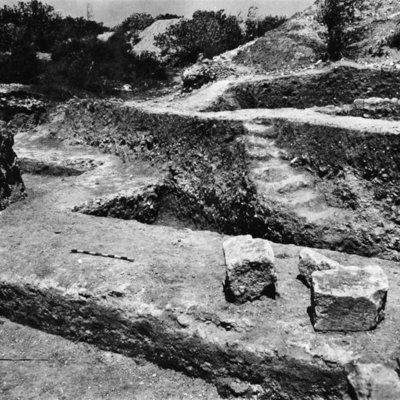 General view of foundations in northeast turn. 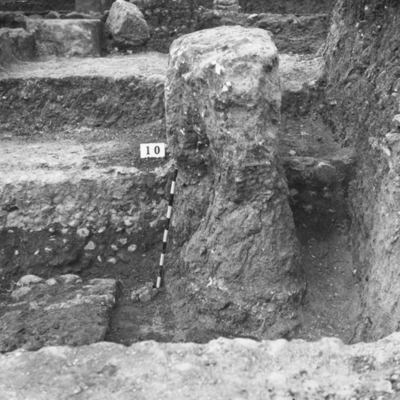 Concrete and rubble foundations northeast of Circus. 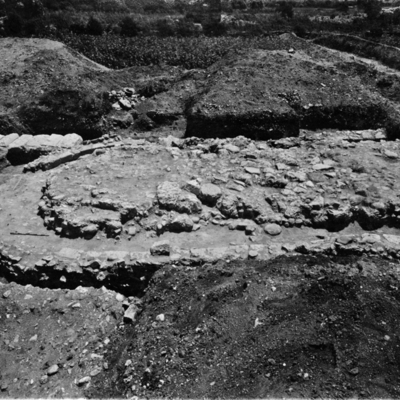 General view of foundations in northeast turn of Circus. 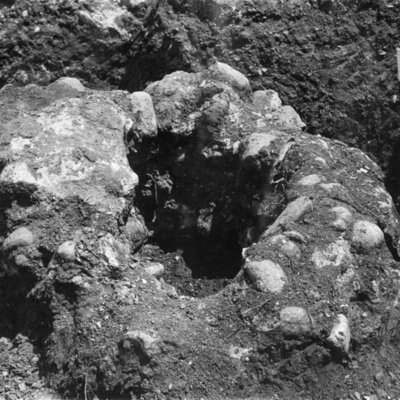 Detail of Doric drum found east of Stair 11. 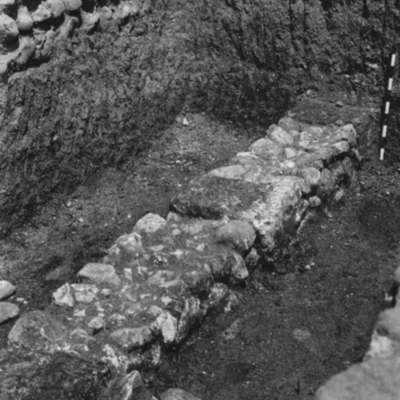 North face of wall built of heavy masonry in emplecton work. 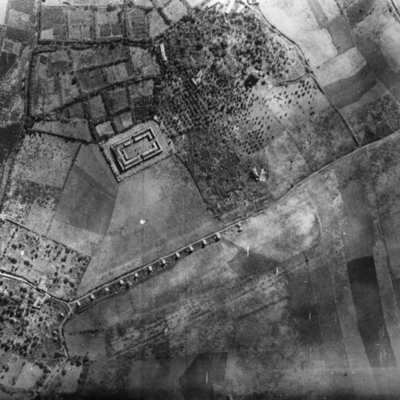 Aerial photo of Circus and temple area. 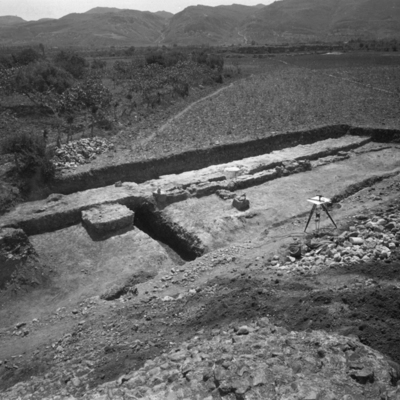 Inner foundation face of carceres. 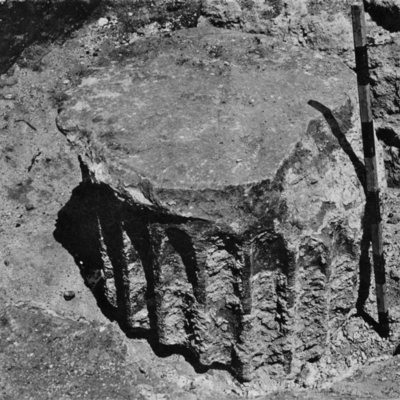 Detail of the so-called meta secunda. 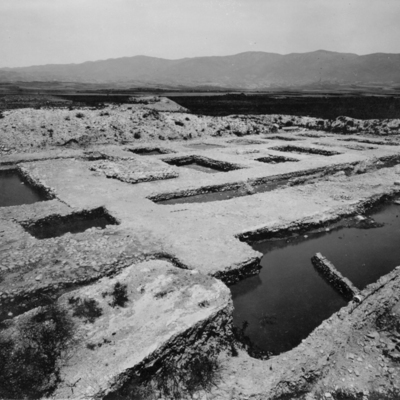 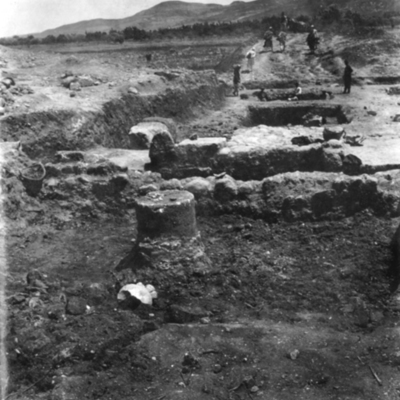 General view of Circus and Byzantine Kiln foundations. 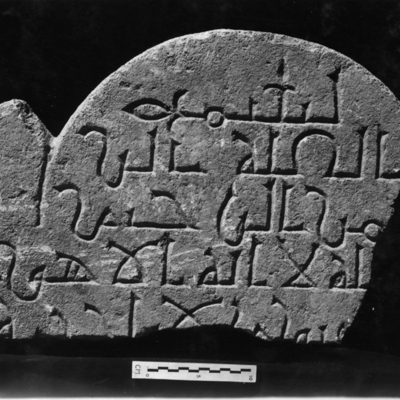 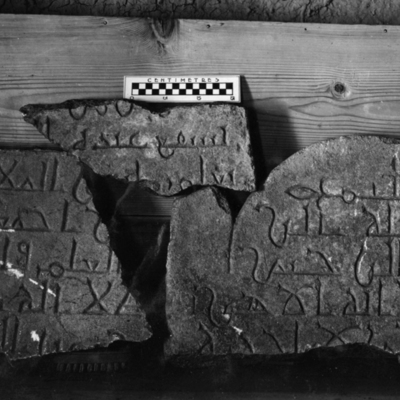 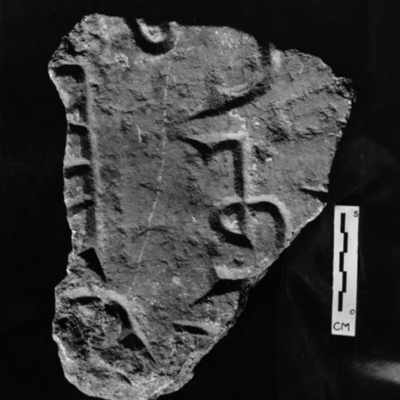 Fragment of limestone stela inscription in florid Cufic. 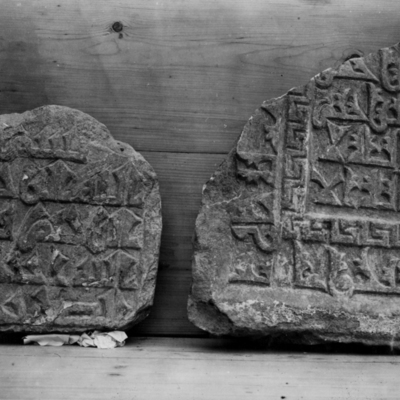 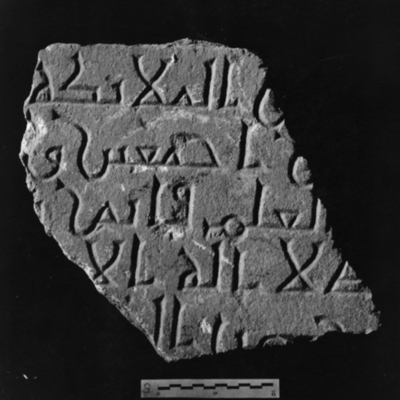 Fragment of limestone stela inscription in ordinary Cufic. 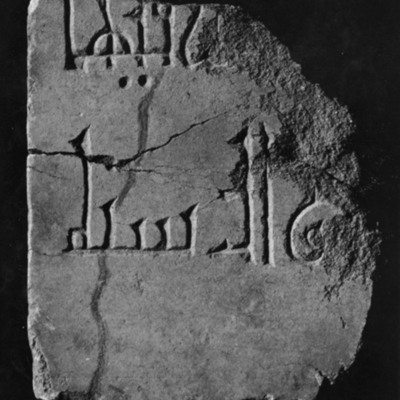 Fragment of limestone stela inscription in simple Cufic. 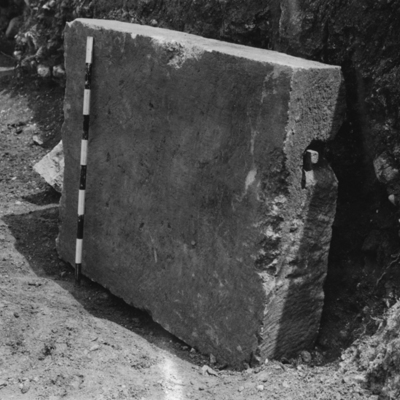 Concrete core of Stair 4. 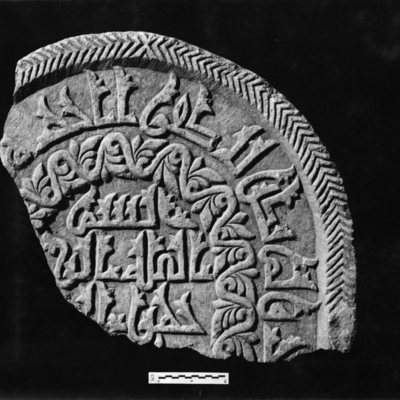 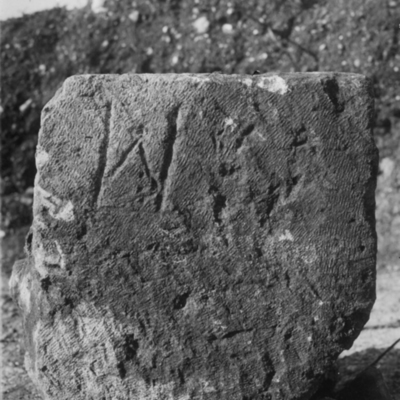 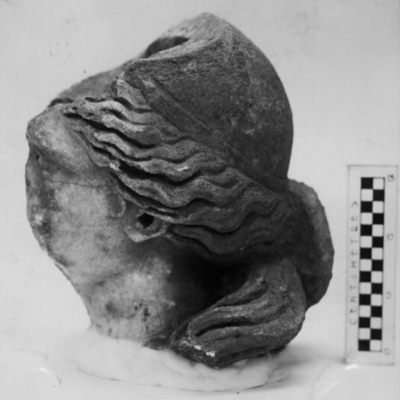 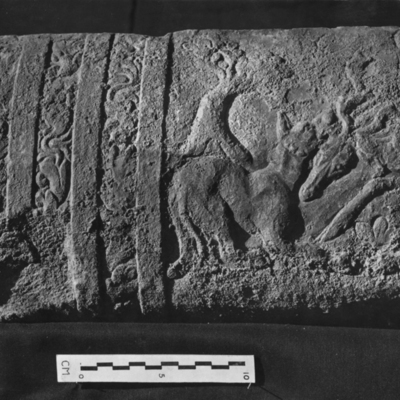 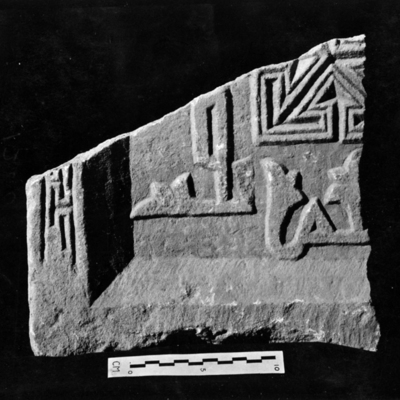 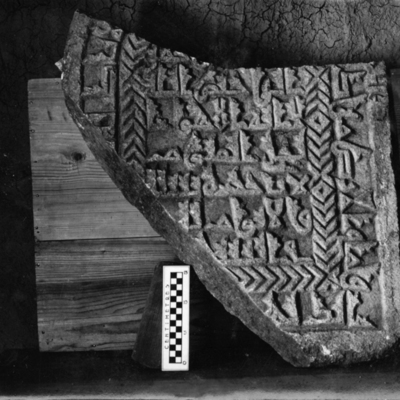 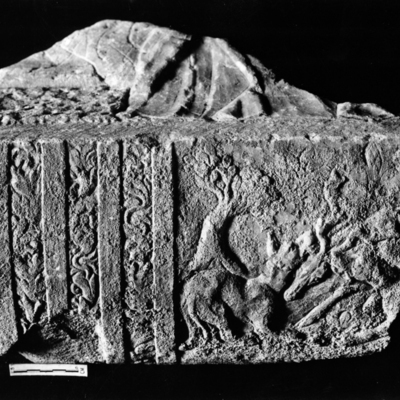 Corner fragment of limestone bearing Cufic inscription. 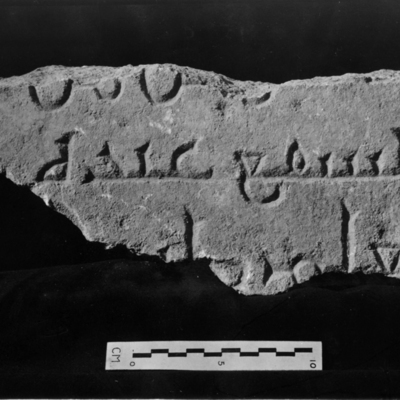 Fragment of limestone with inscription in simple Cufic. 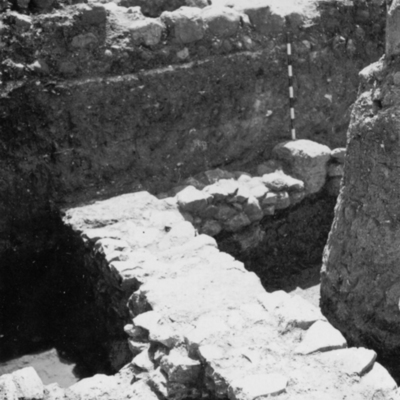 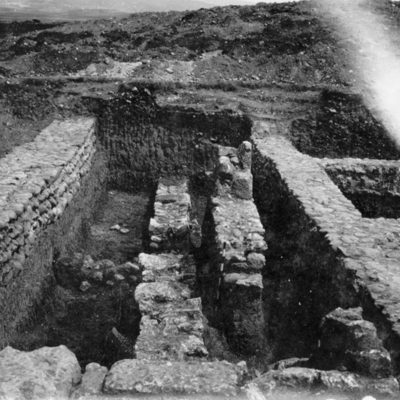 General view of excavations in southeast corner. 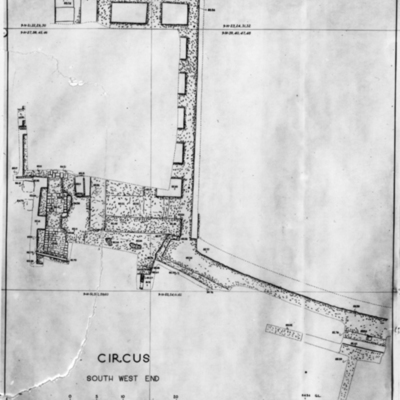 Preliminary restoration plan of the Circus. 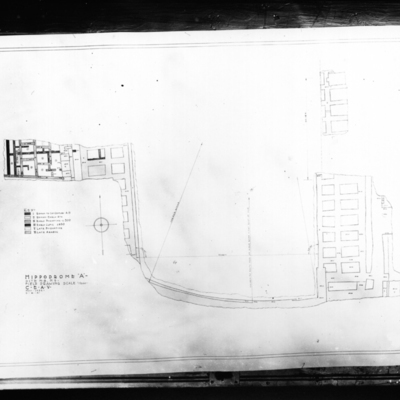 Field plan of northeast curve and Byzantine kiln area. 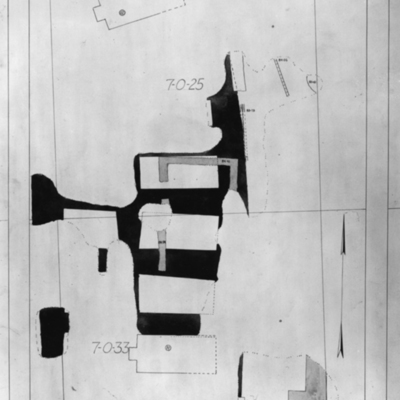 Sections from north end drawing #103-s/1. 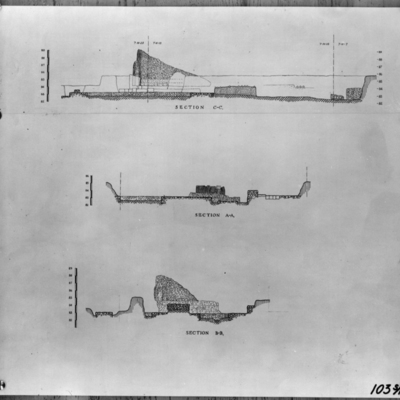 Plan and section northeast curve of Circus and Byzantine Kiln drawing #103d. 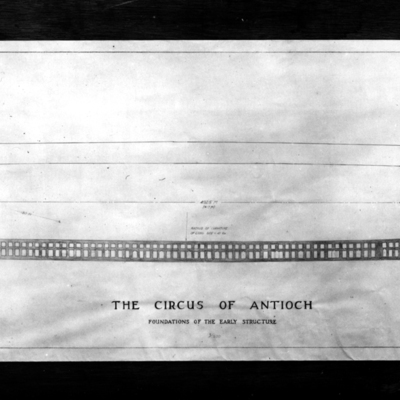 Plan northeast curve of Circus and Byzantine Kiln drawing #103c. 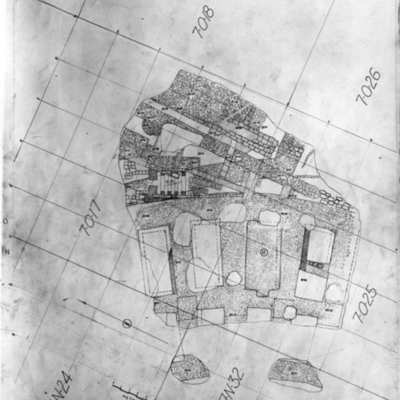 Plan Porta Triumphalis excavations drawing #103b. 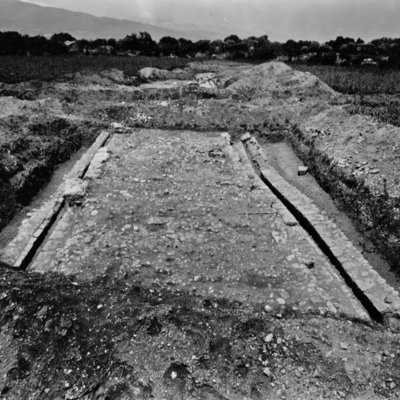 General view of the meta prima. 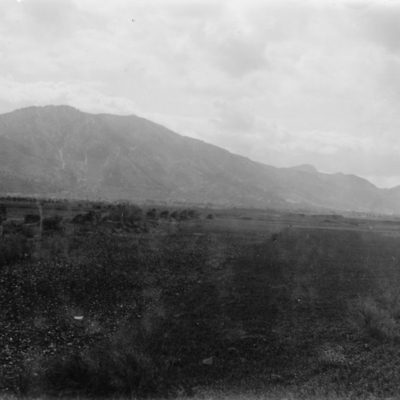 General view of the area north of the meta prima. 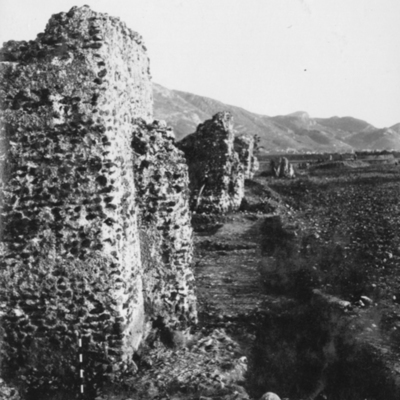 North end of the spina. 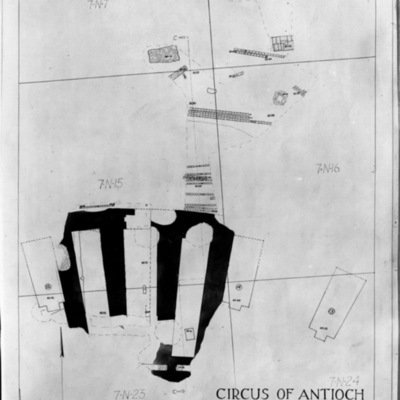 Field plan of the Circus. 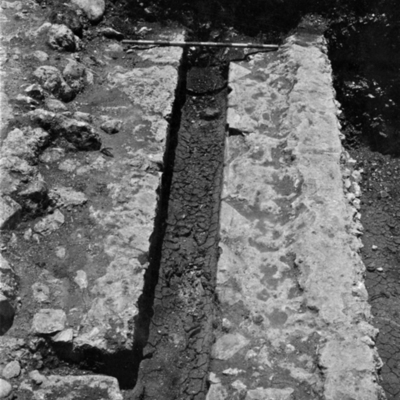 Gutter along west side of spina south end. 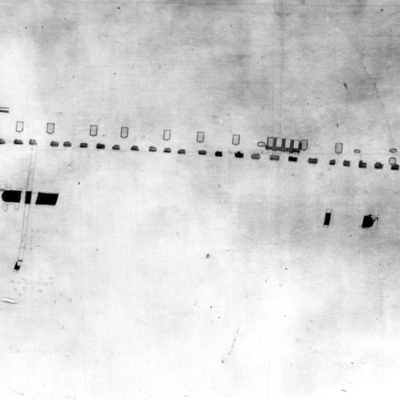 General view of the meta secunda. 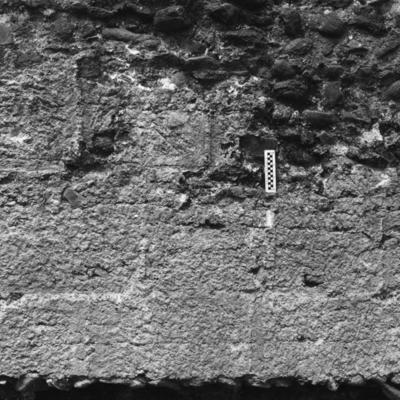 Detail of the meta secunda. 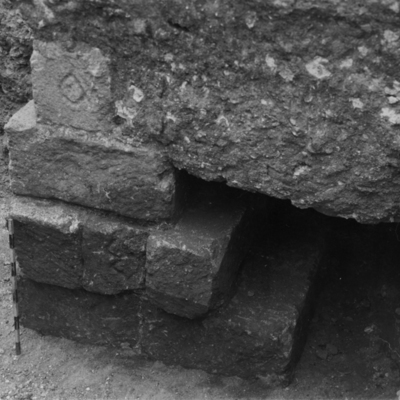 Detail of blocks in situ inner face of south wall. 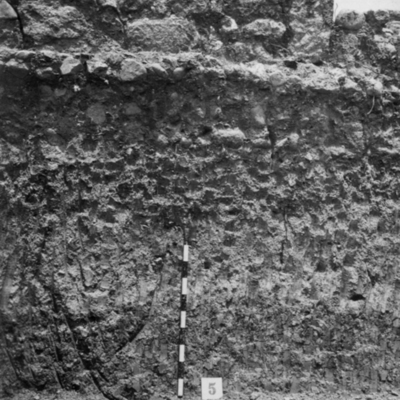 General view of blocks in situ inner face of south wall. 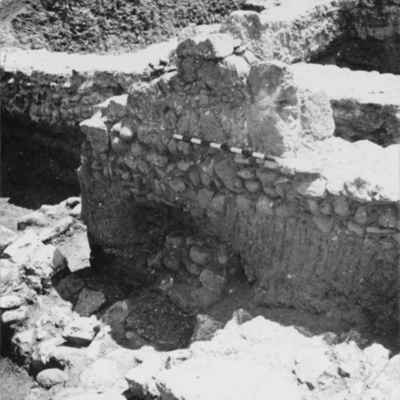 Arab walls over west wall foundation. 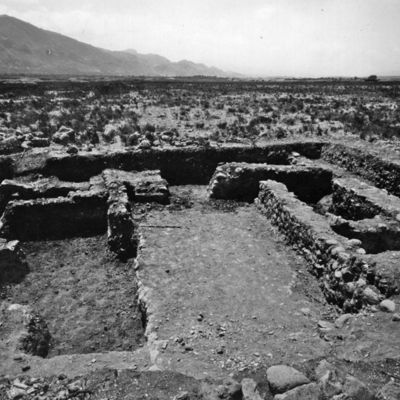 General view of southwest corner. 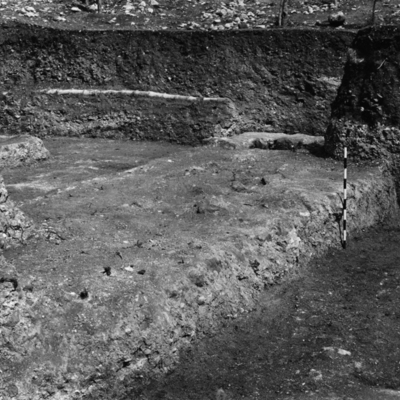 Foundations and ramp east side. 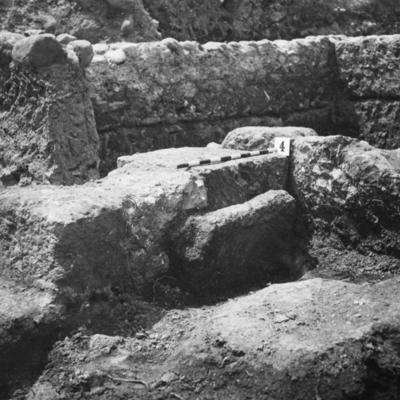 Detail of ramp showing displacement east side. 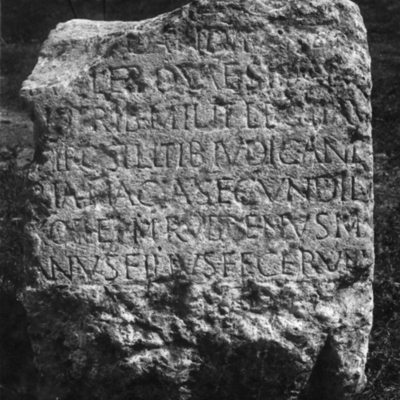 Limestone epitaph in Latin. 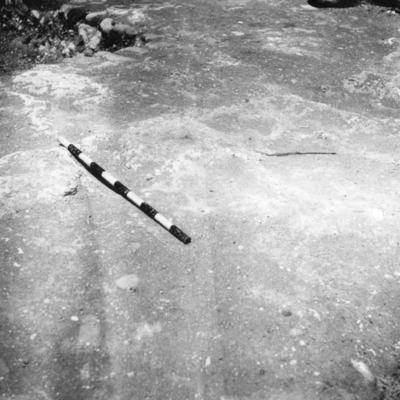 Surface find in the vicinity of the Circus. 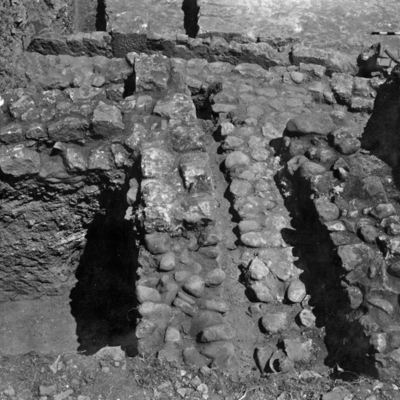 Detail of late drains and walls over tower foundations. 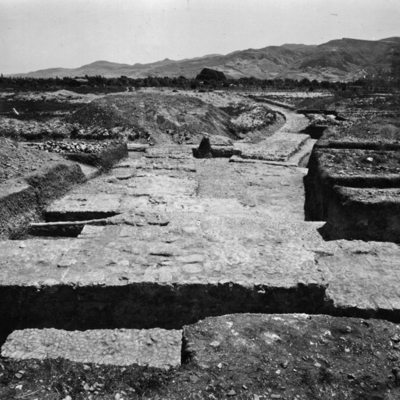 View of foundations at southwest angle of cavea and carcares. 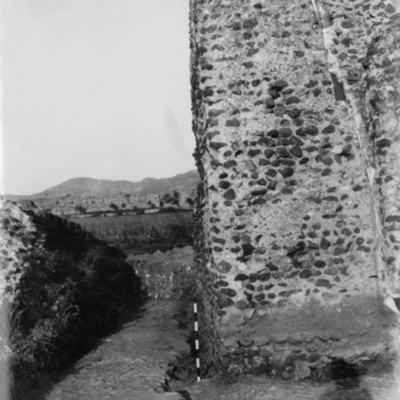 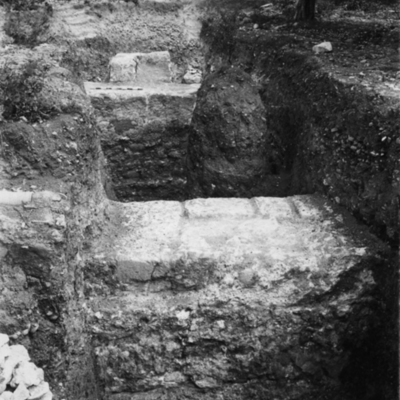 View of tower foundations at passageway. 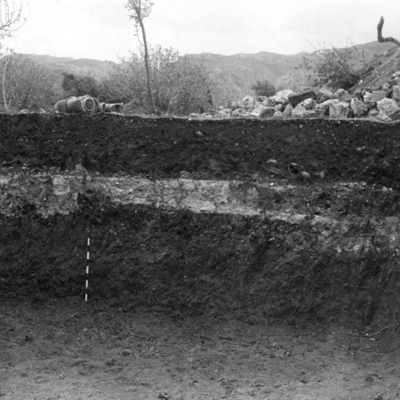 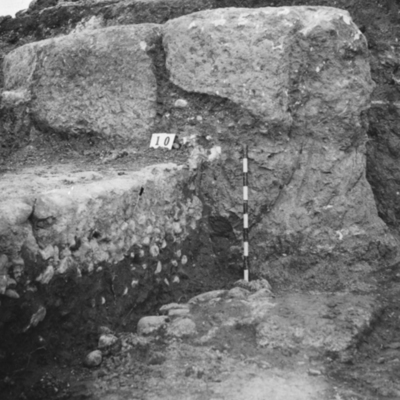 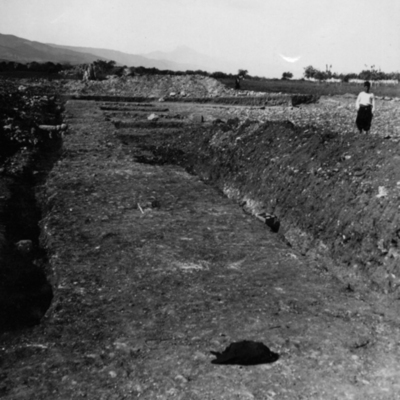 Late walls over foundations of west cavea. 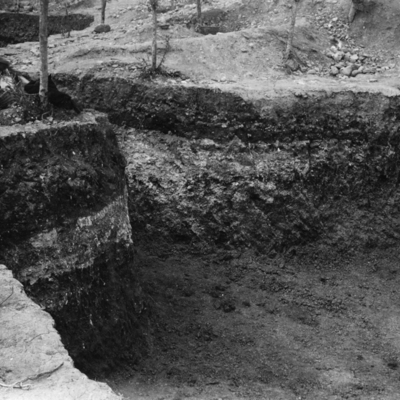 Drain running north from the meta prima. 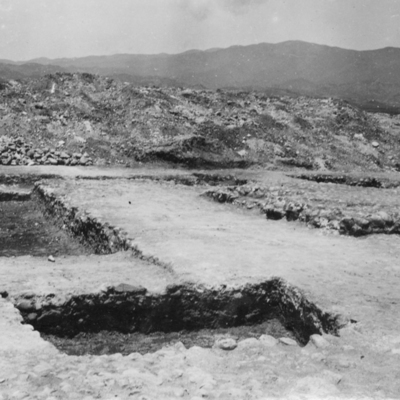 General view of southwest join of cavea and carcares. 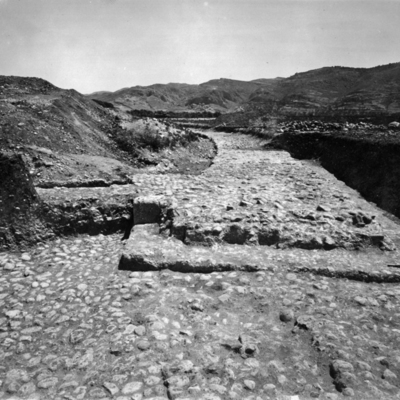 View of road south of the foundation over carcares. 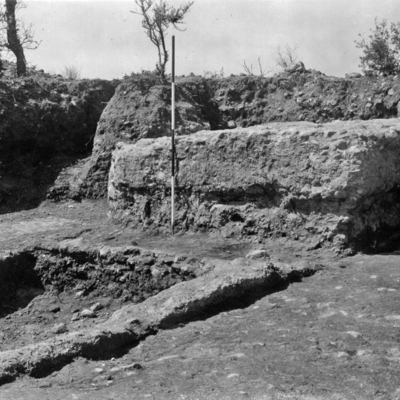 View of southwest end of cavea late drains and walls over tower foundations. 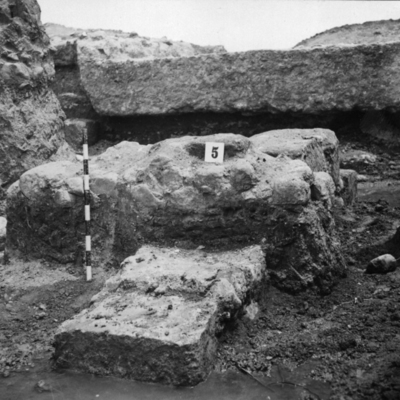 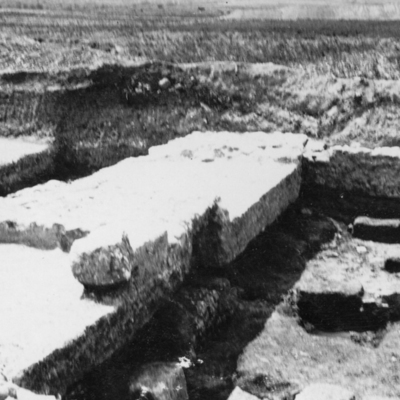 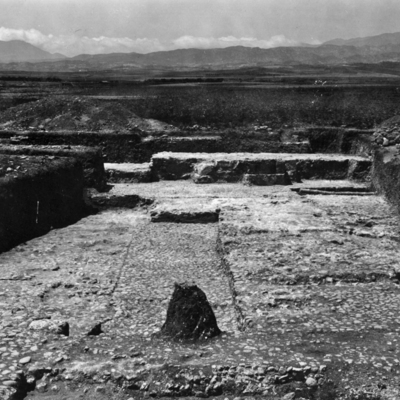 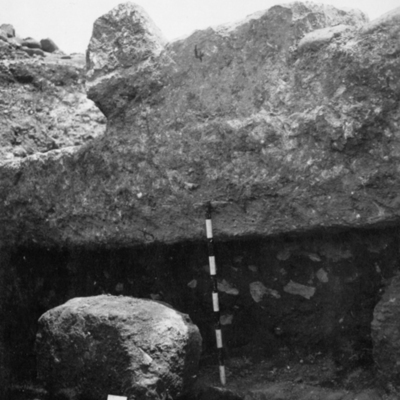 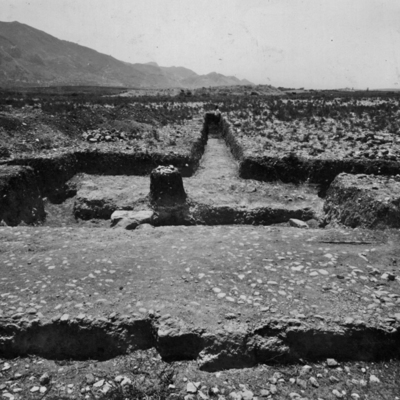 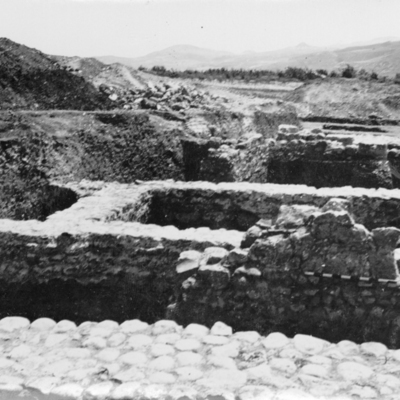 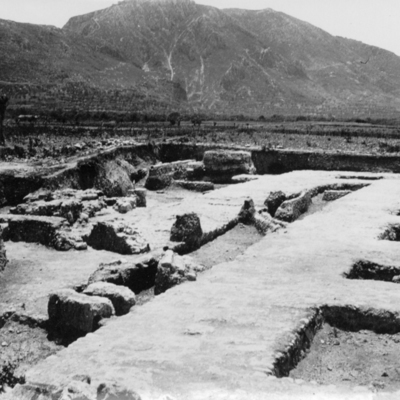 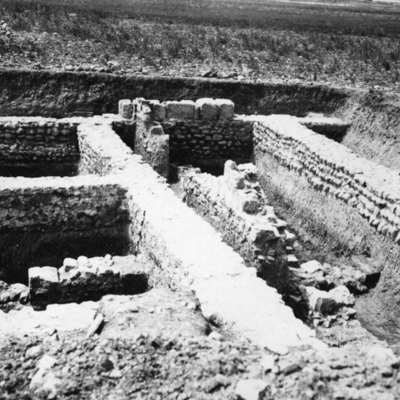 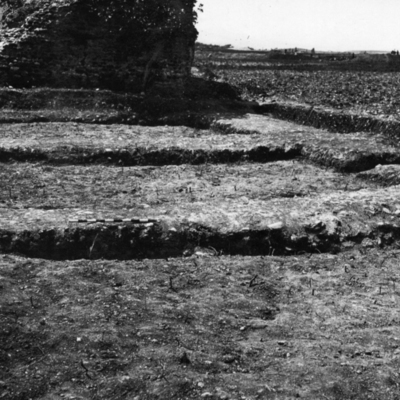 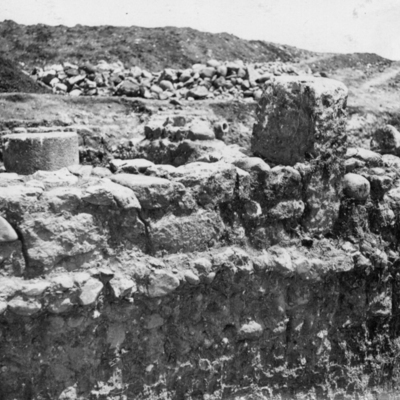 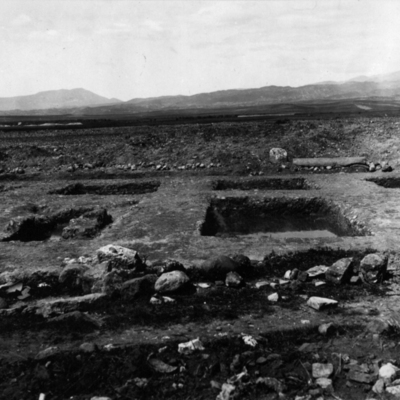 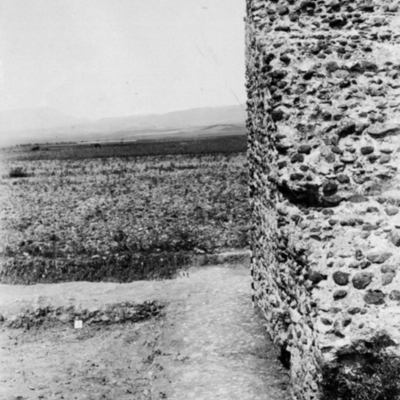 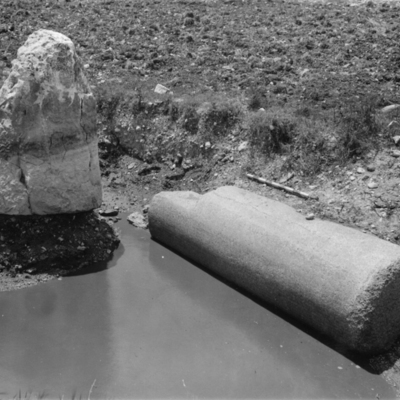 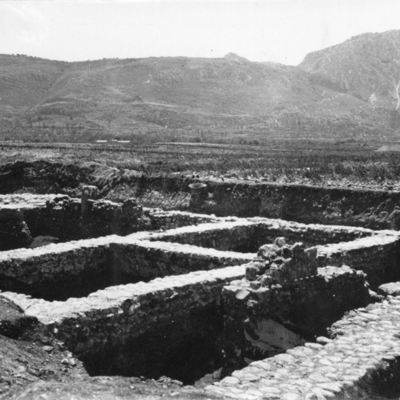 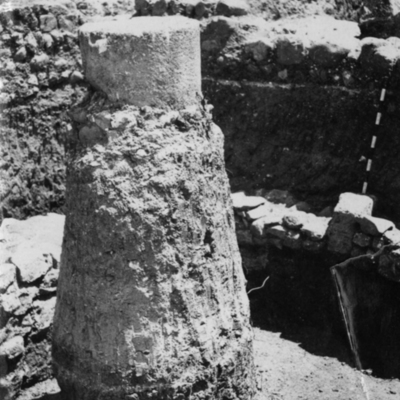 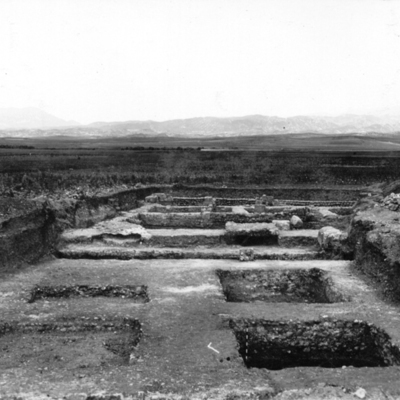 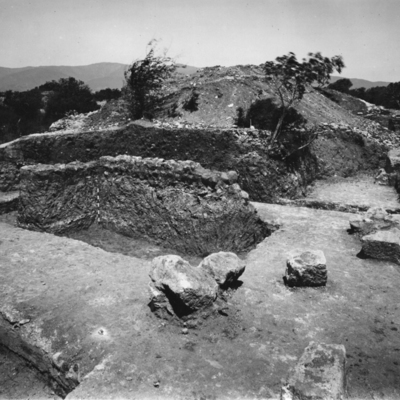 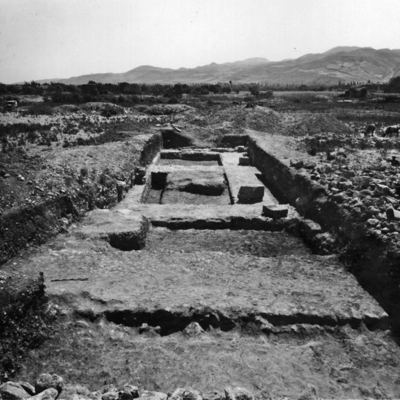 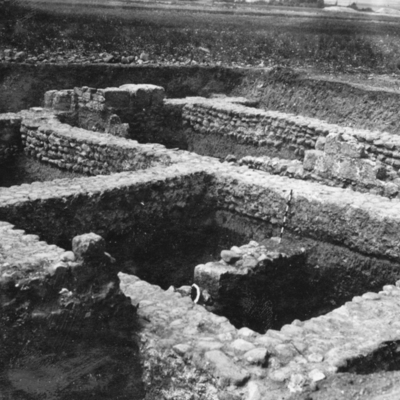 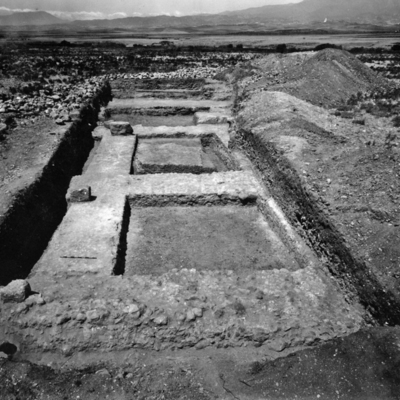 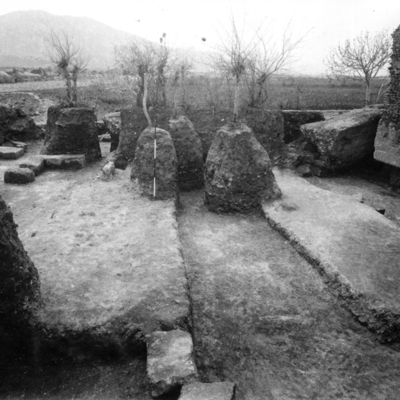 View of raod tower foundations & later reconstruction at southwest end of cavea. 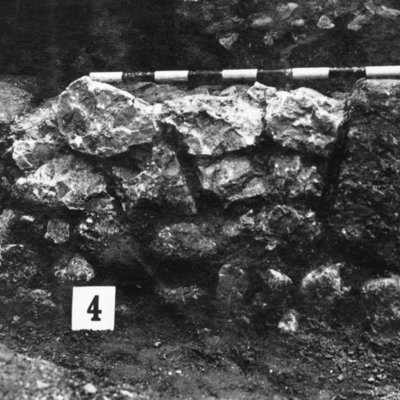 Detail of late walls over south tower foundations. 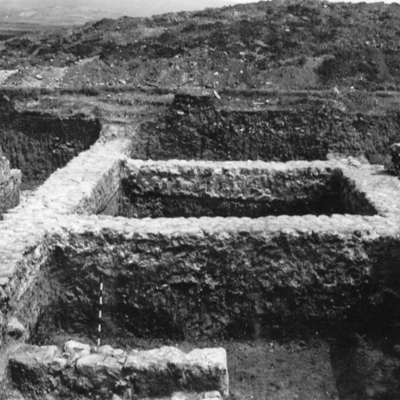 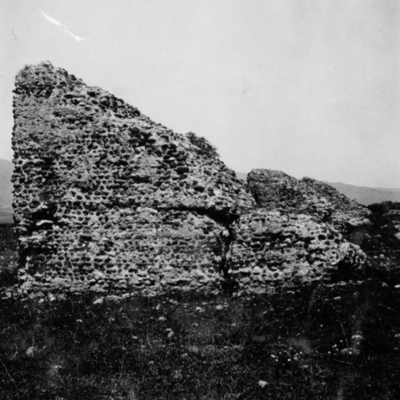 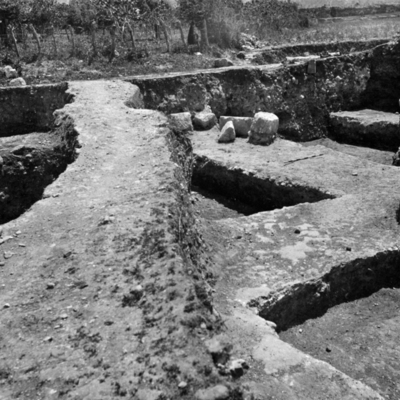 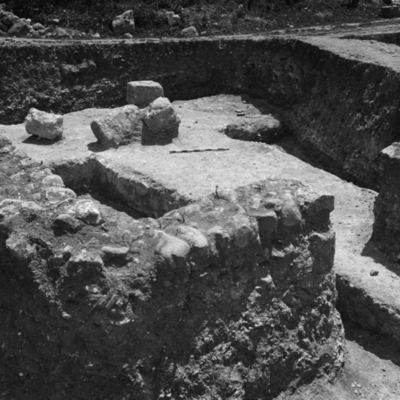 Detail of tower foundations and later reconstruction at southwest end of cavea. 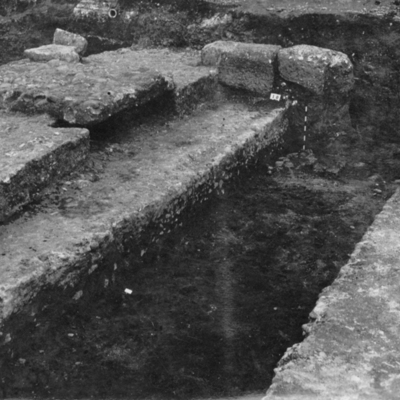 Detail of tower foundations at southwest end of cavea. 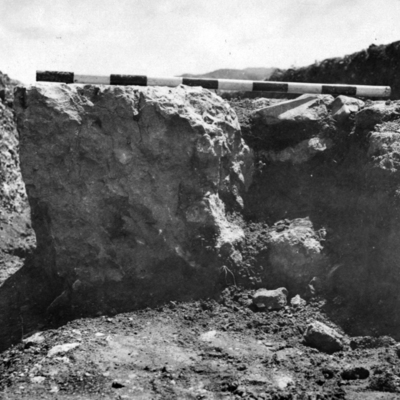 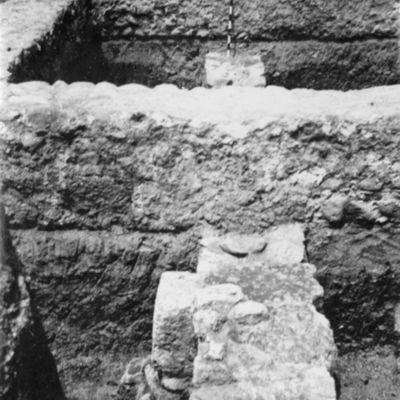 Detail of late drain over south tower foundations. 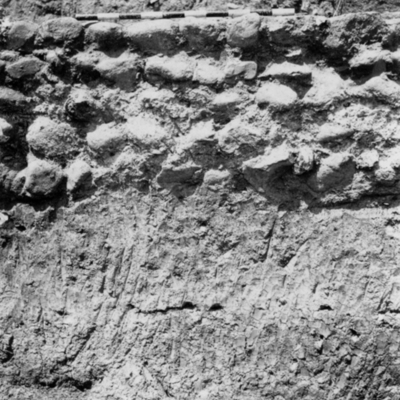 Detail of ramp on east side showing displacement. 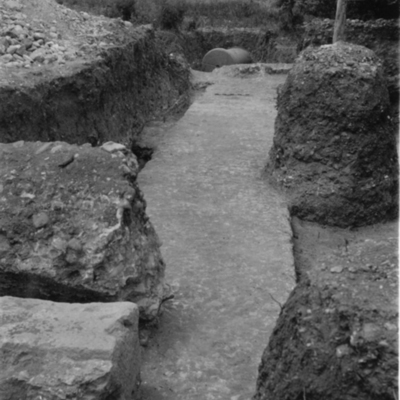 General view of ramp on east side showing displacement. 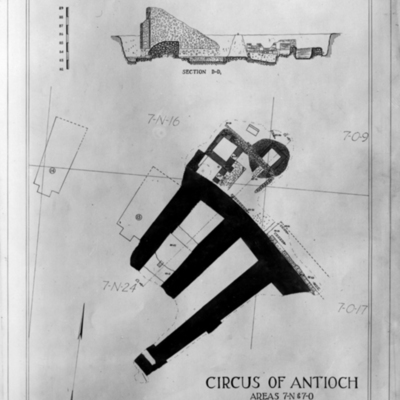 Plan of the southwest end of the Circus. 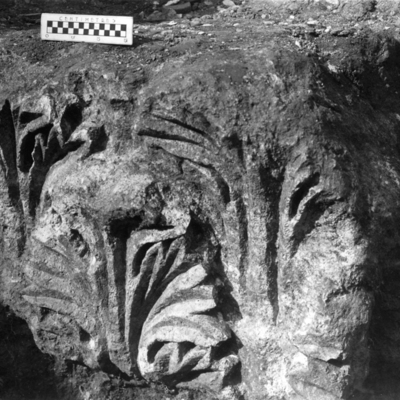 Ionic capital found on west side. 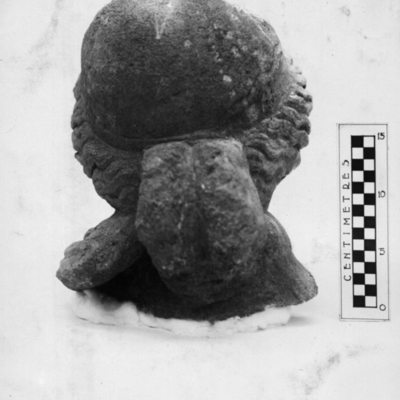 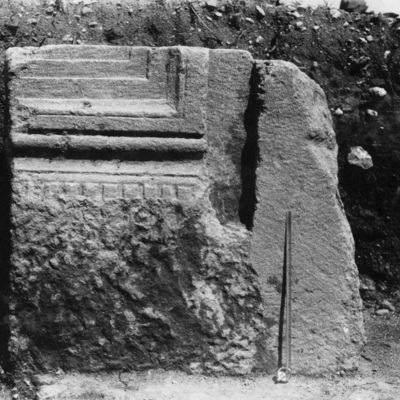 General view of west side showing marble head in situ. 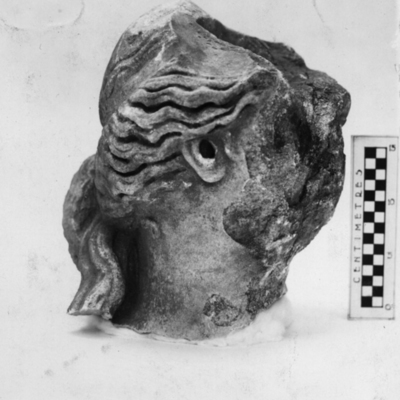 Marble female head front view. 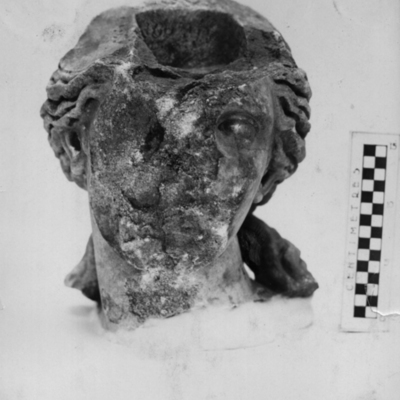 Marble female head right side. 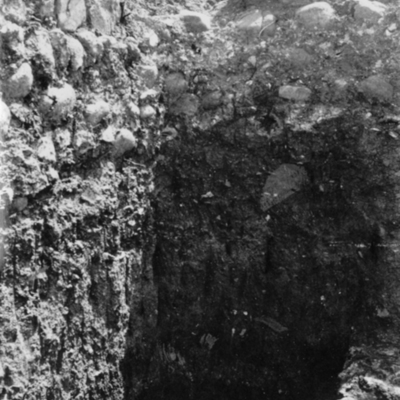 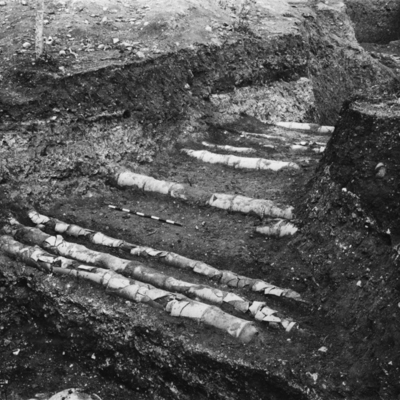 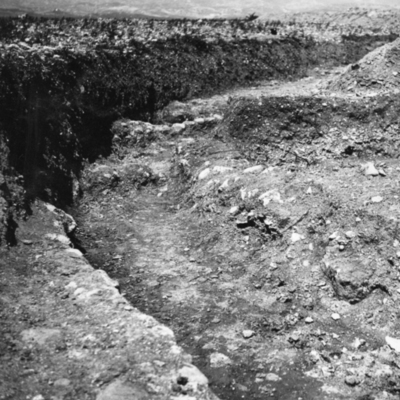 General view of west trench. 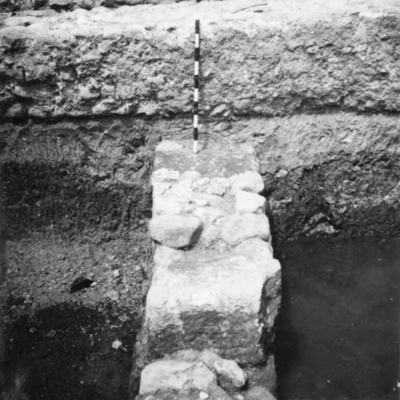 Detail of aisle ramp foundation. 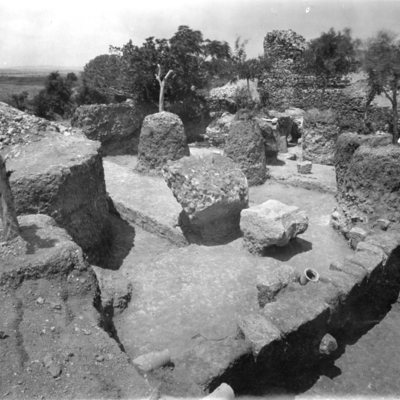 General view of Room 3. 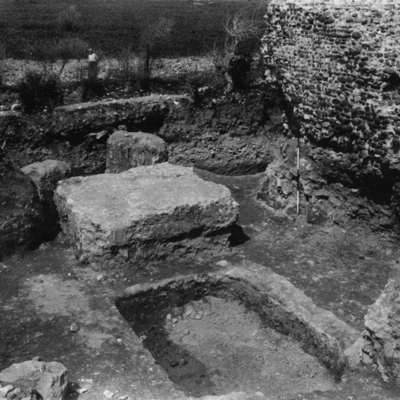 General view of Room 10. 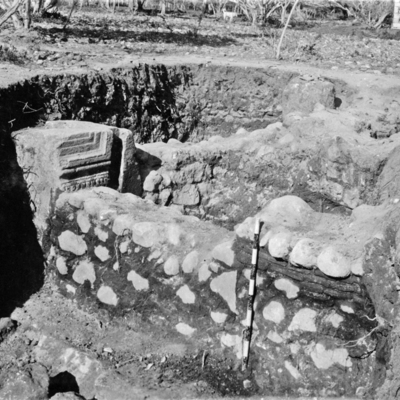 Detail of arch foundation near southwest angle. 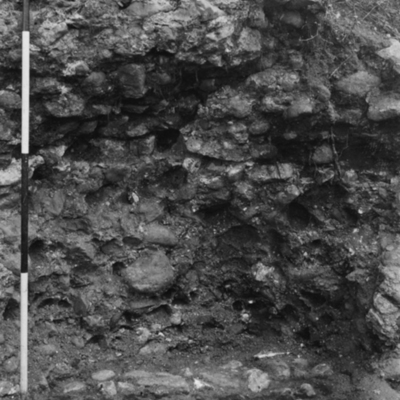 Detail of arch foundation near southwest angle middle of west side. 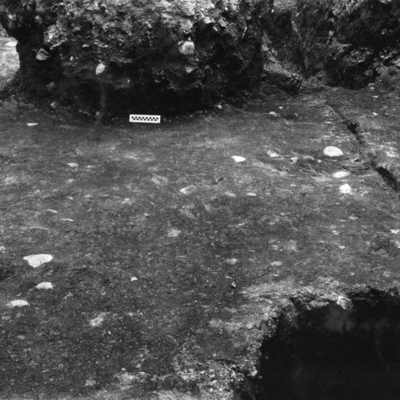 Detail near north end of Room 10. 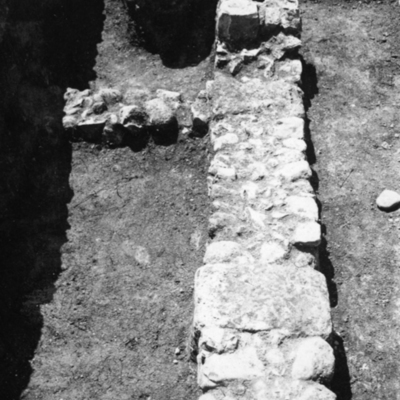 Detail of northwest angle of Room 10. 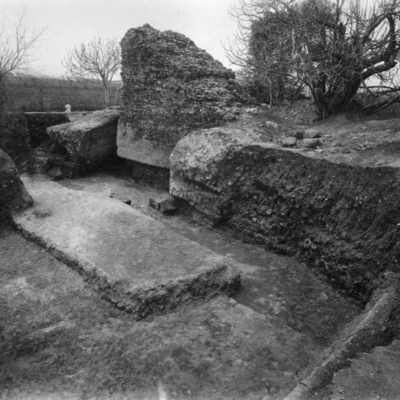 General view of Room 4. 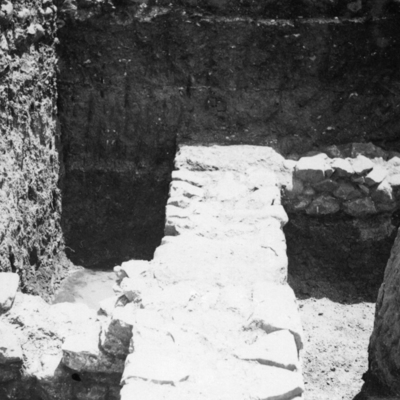 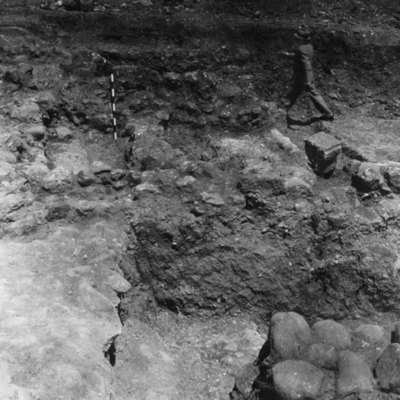 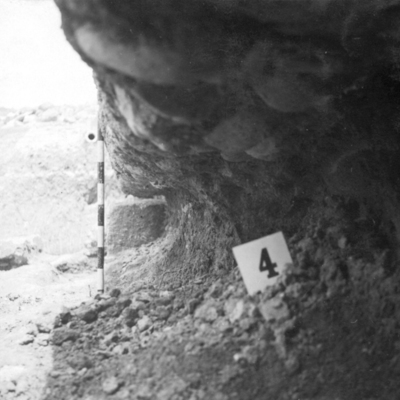 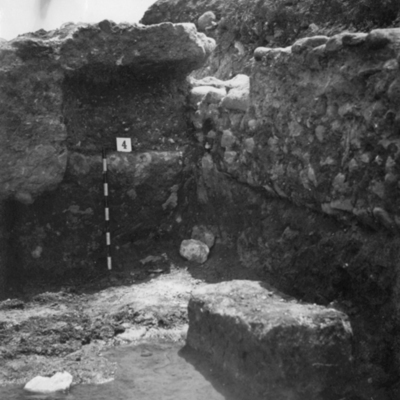 Detail of southeast angle of Room 4 in west trench. 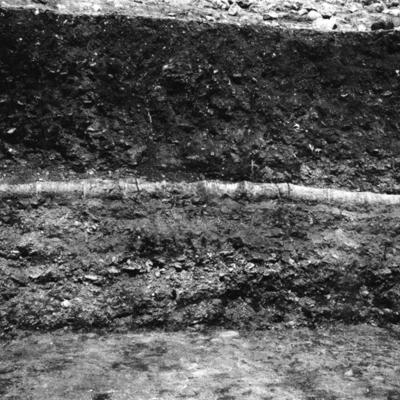 Detail of east side of Room 4 west trench. 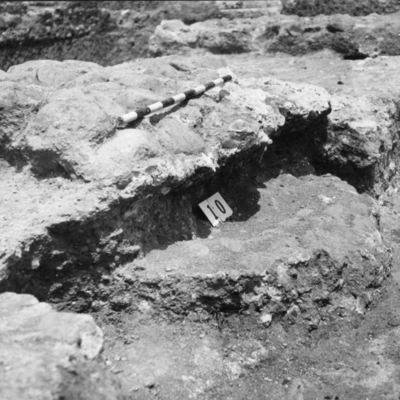 Detail near northeast angle of Room 4 west trench. 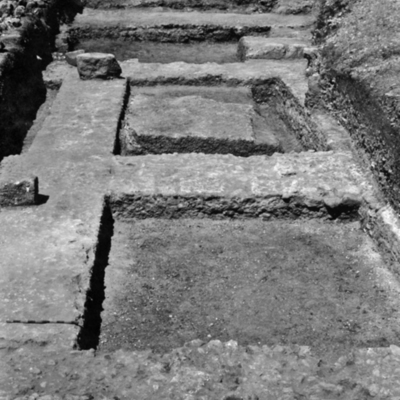 Detail period 1 construction in Room 4. 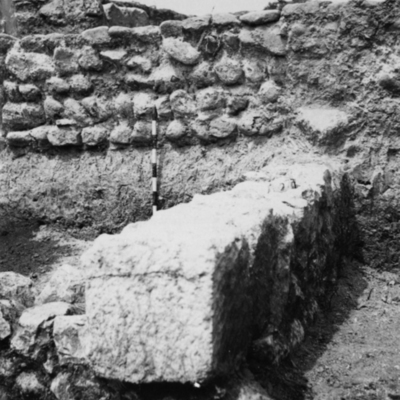 House walls west of the hippodrome. 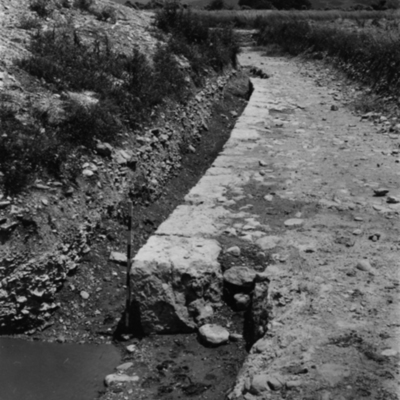 Canal and angle of set-off east side. 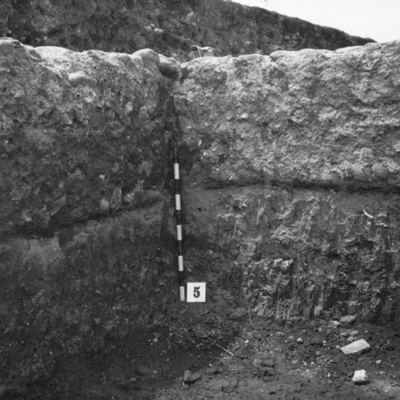 Fragment of moulding in situ east side. 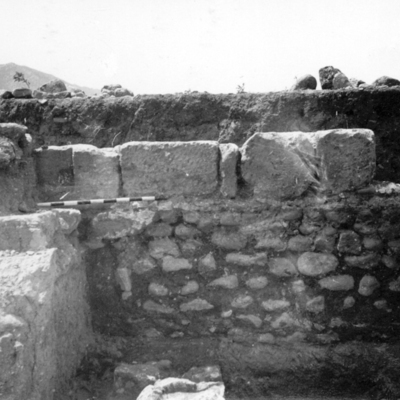 House walls on west side. 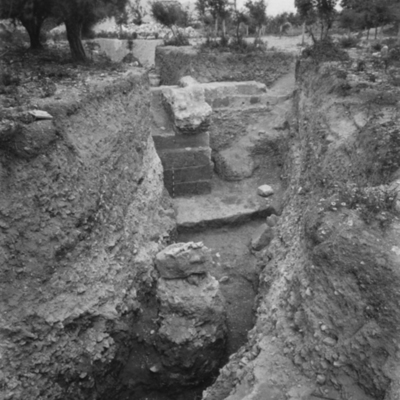 Foundation wall on east side. 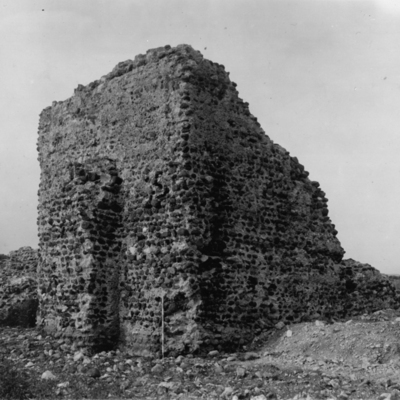 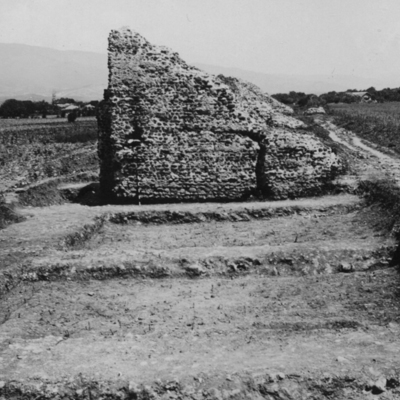 House walls west of hippodrome. 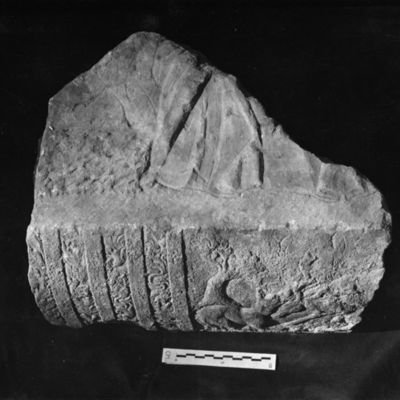 L--upper part of limestone stela. 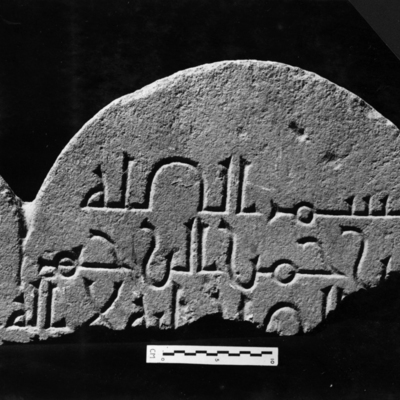 R--lower part of white marble stela. 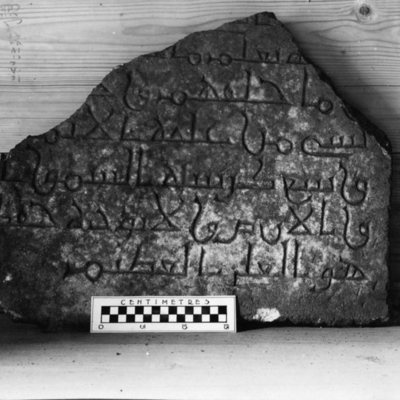 Both in simple Kufic. 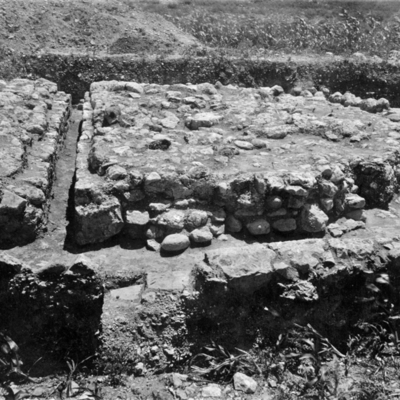 General view of foundation walls east side. 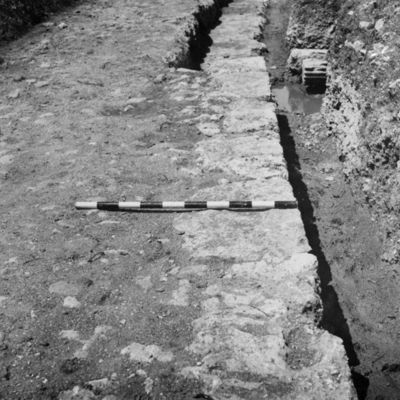 Detail of road in southeast corner . 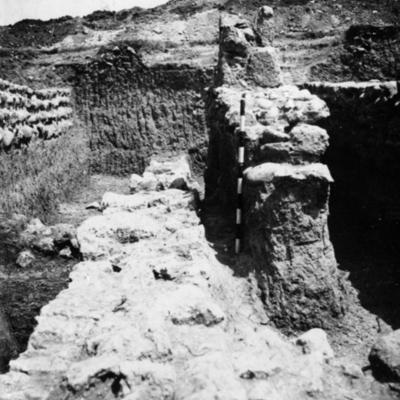 General view of house walls to west of hippodrome. 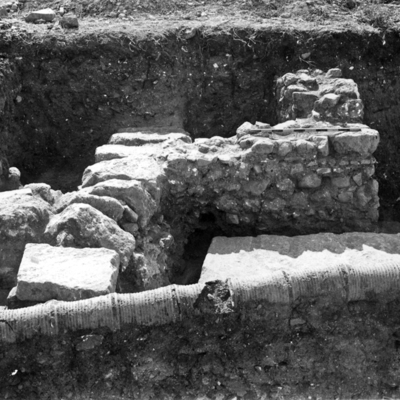 House walls west of hippodrome detail. 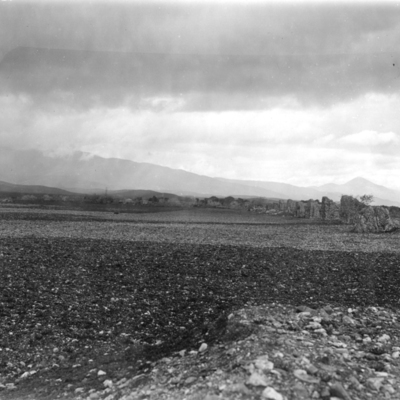 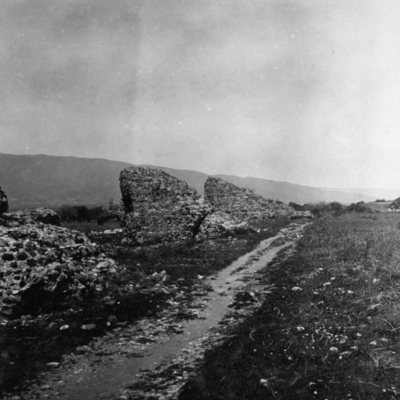 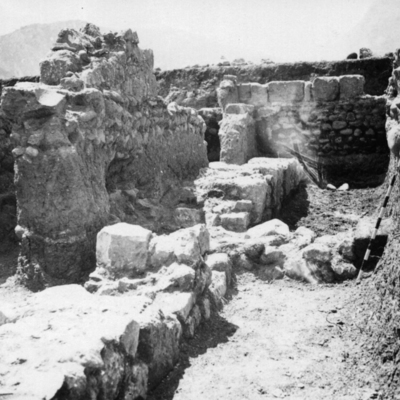 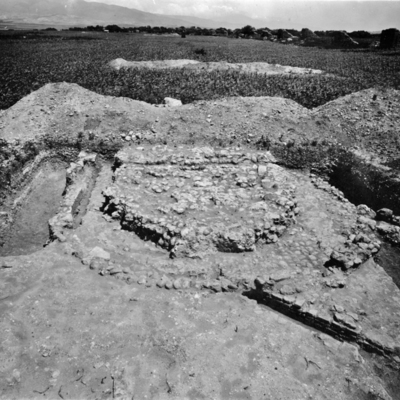 View of the Circus ruins before excavation. 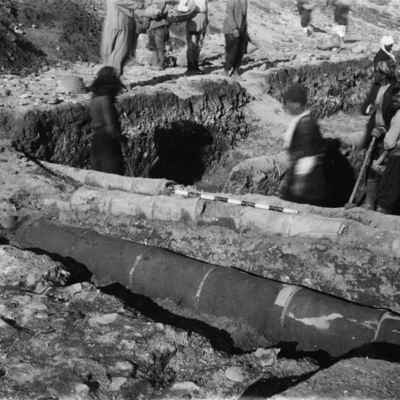 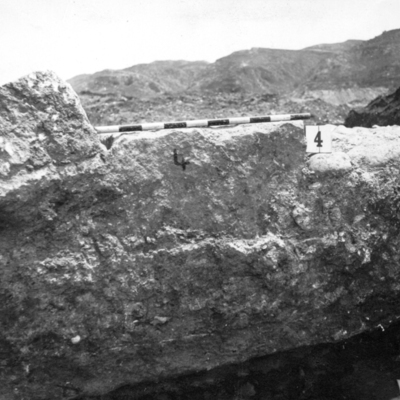 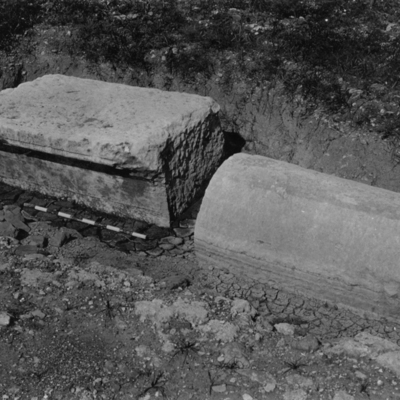 Concrete core of Stairway 4. 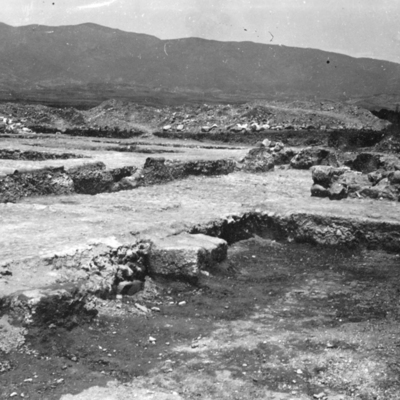 View of Circus area before excavations. 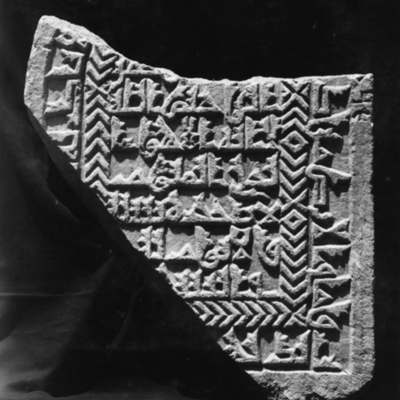 Lower frag of limestone stela in florid Kufic. 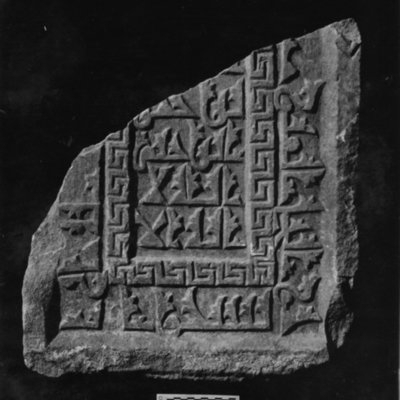 Upper frag of limestone stela in florid Kufic. 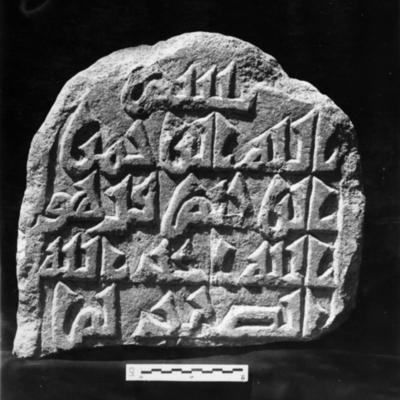 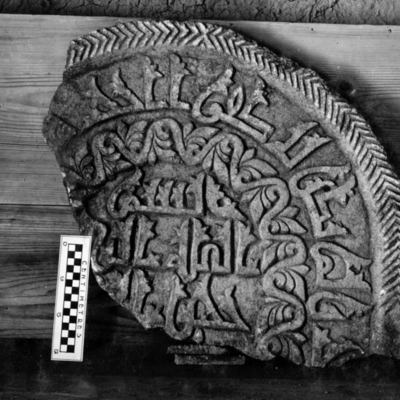 Lower frag of limestone stela in ordinary Kufic. 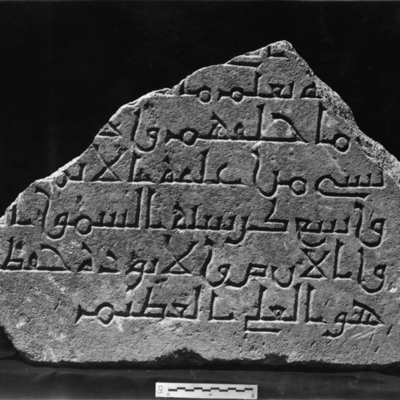 Frags of limestone stela in ordinary Kufic. 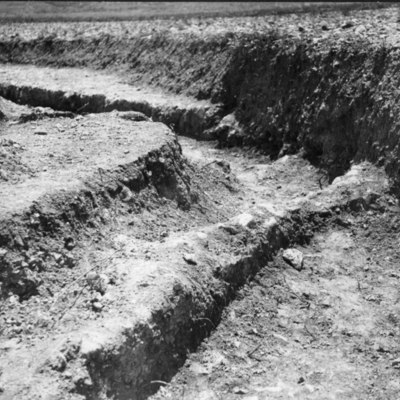 Foundations in north end of trench. 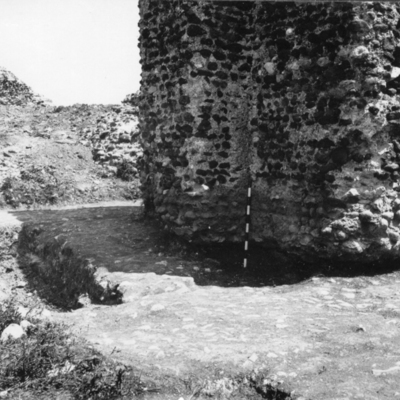 General view of inner wall. 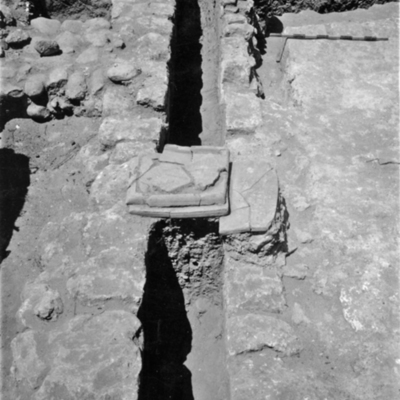 General view outer wall and drains. 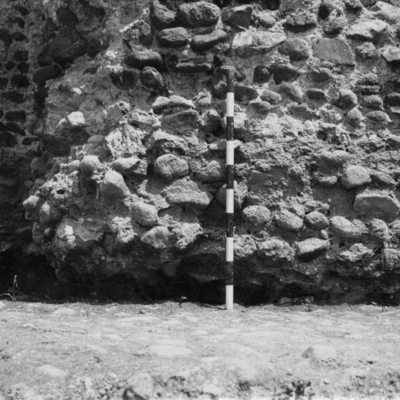 Stratification against outer wall in southeast corner. 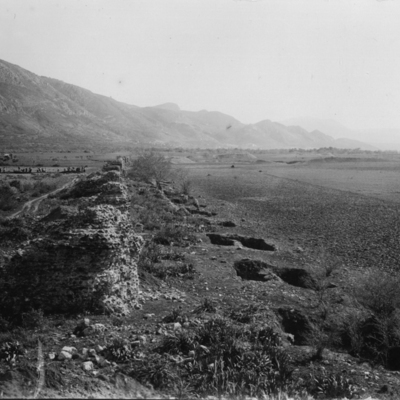 General view of the ruins and land. 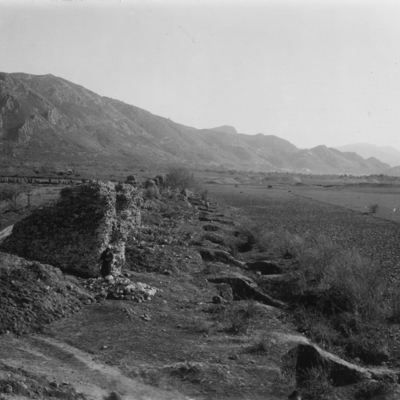 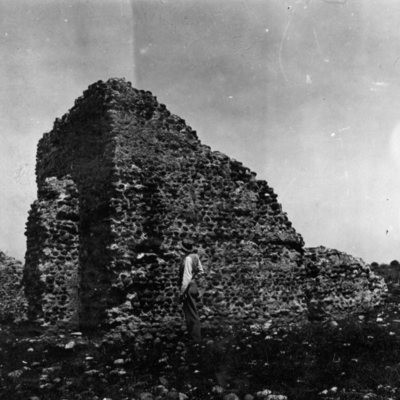 General view of ruins and land. 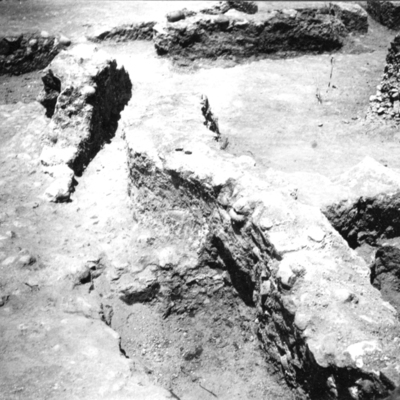 View along east wall from atop the podium foundations. 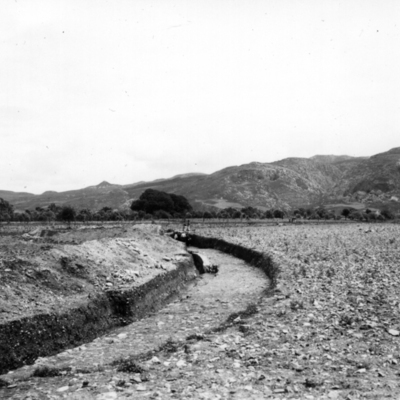 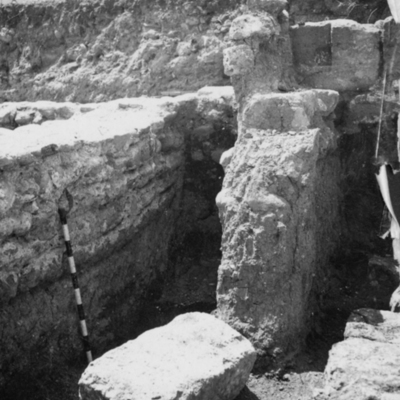 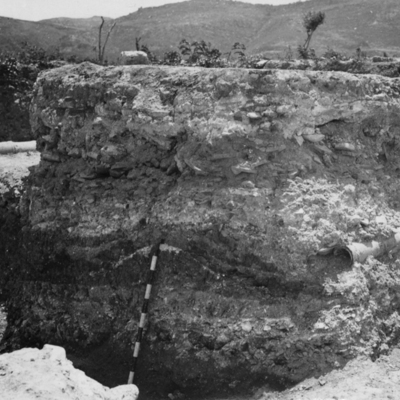 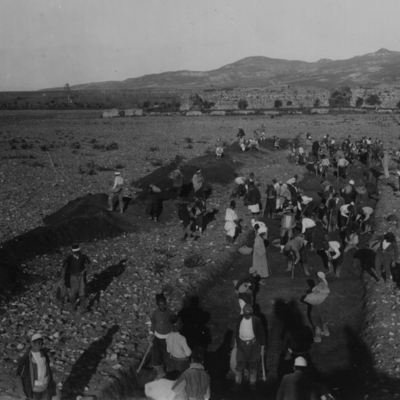 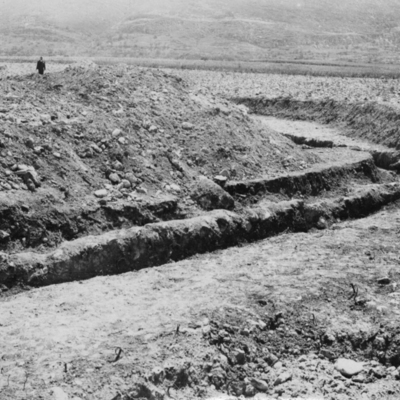 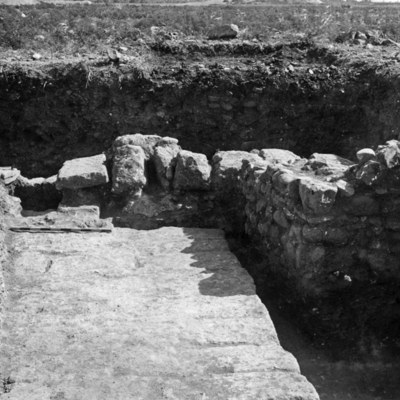 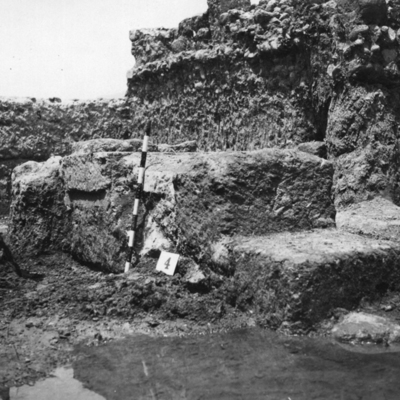 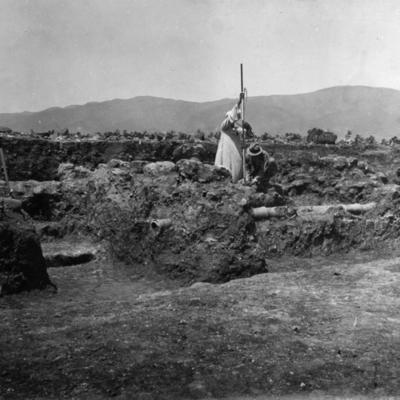 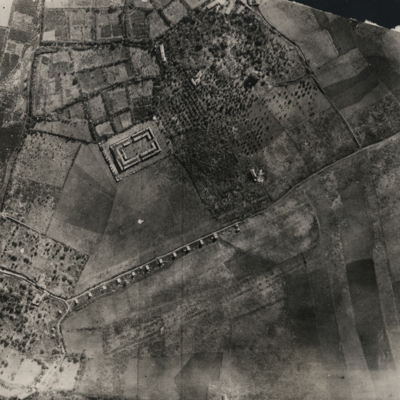 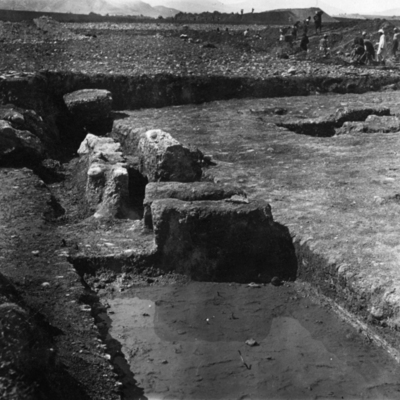 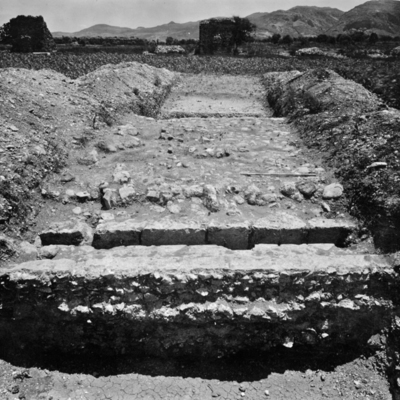 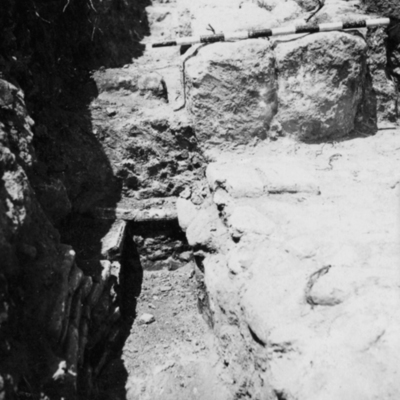 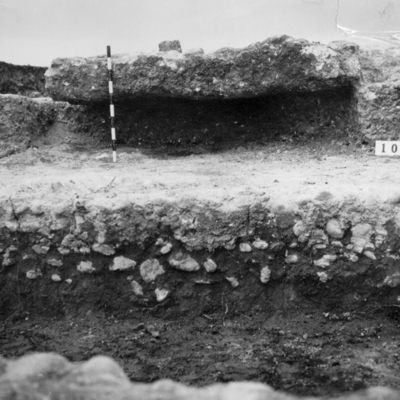 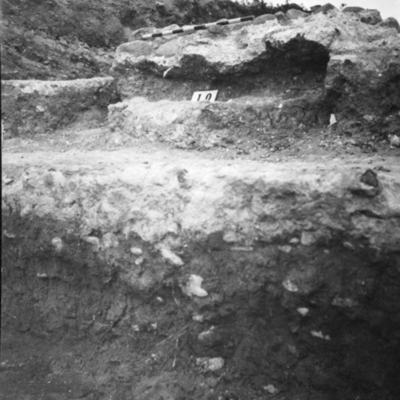 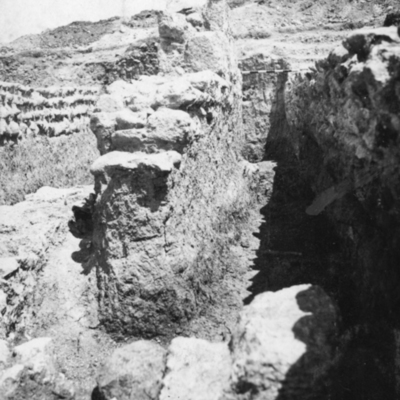 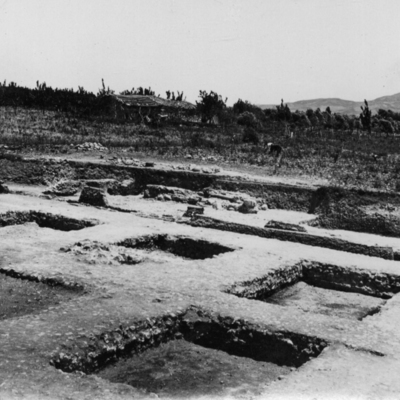 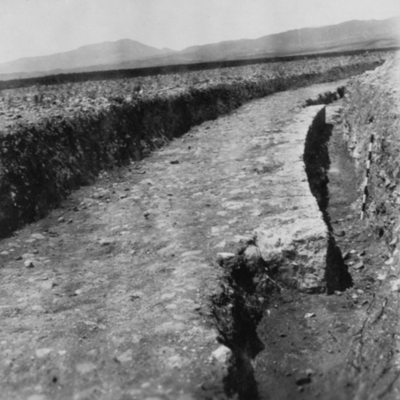 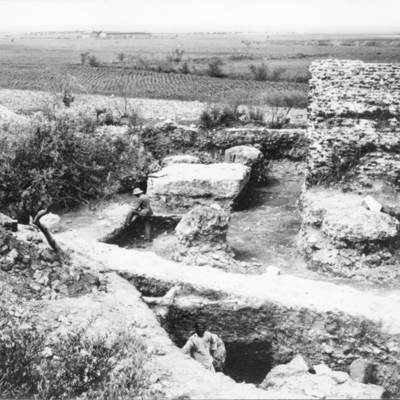 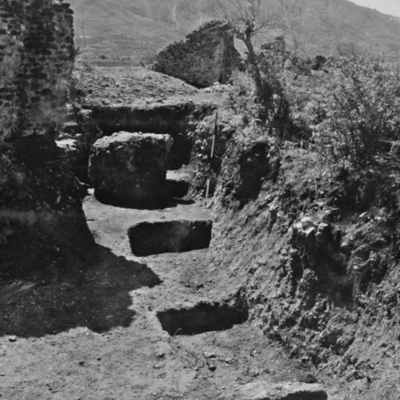 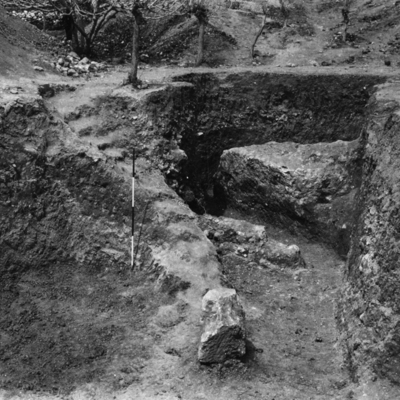 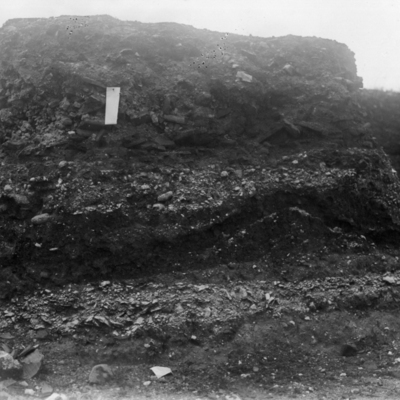 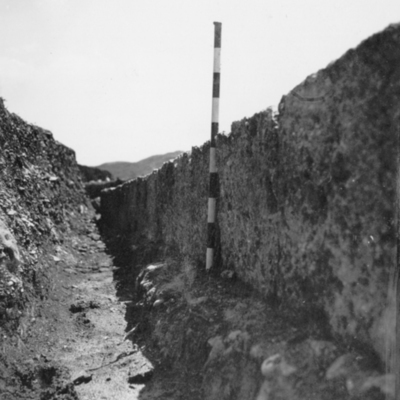 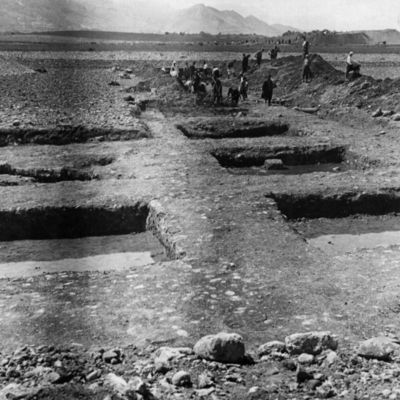 General view of the "Hippodrome to Temple" trench at the beginning of work. 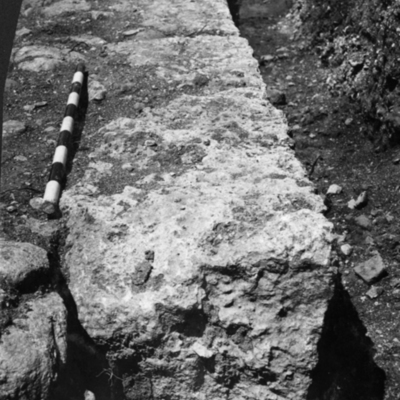 Door jamb of Circus re-used in a Byzantine house wall. 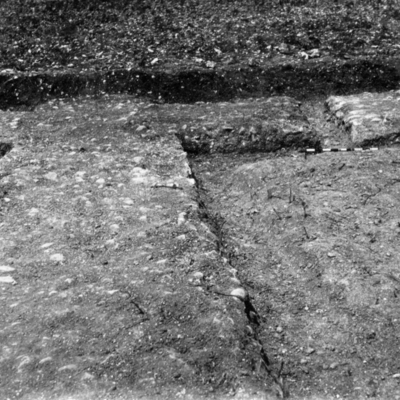 Long east side over Podium foundation limestone block with inscription. 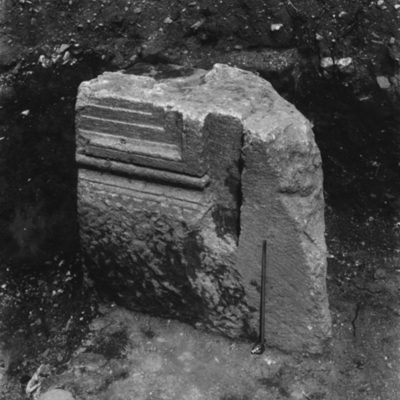 Upper section of door jamb. 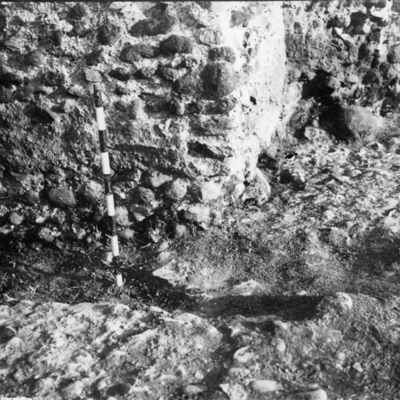 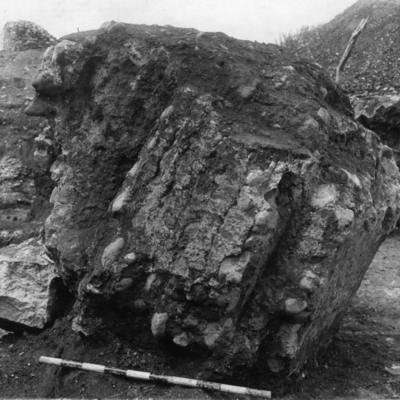 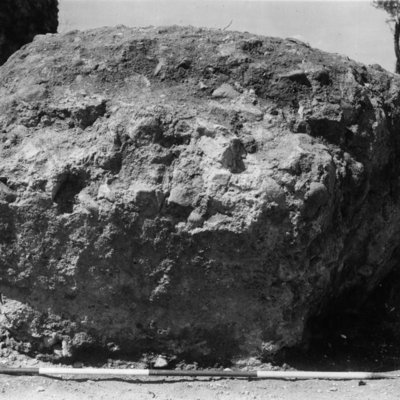 Rubble core of outer Circus wall showing imprint of centering boards and limestone blocks. 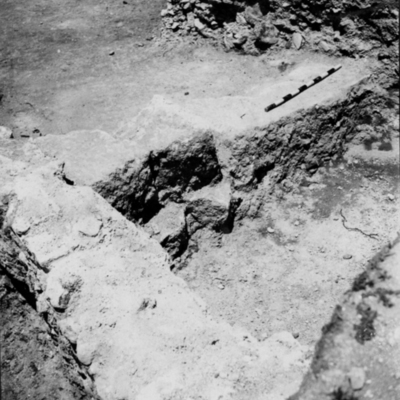 Collapsed rubble/concrete vault northwest of Stair 12 over outer wall of Circus. 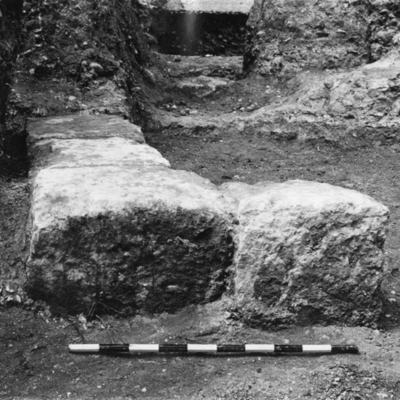 Pilaster capital just beyond wall of Circus. 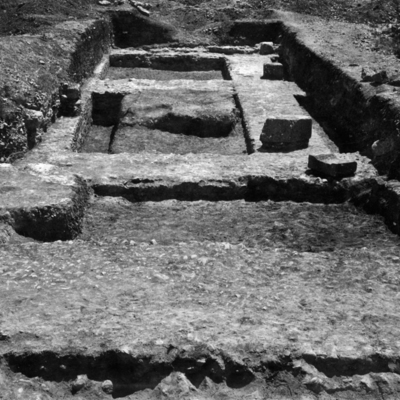 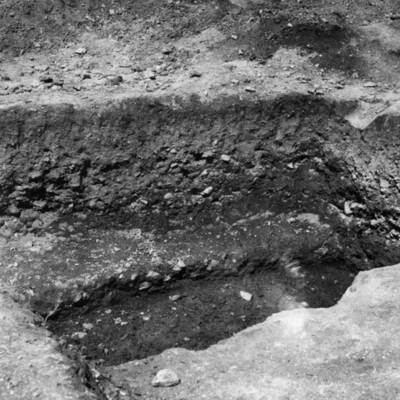 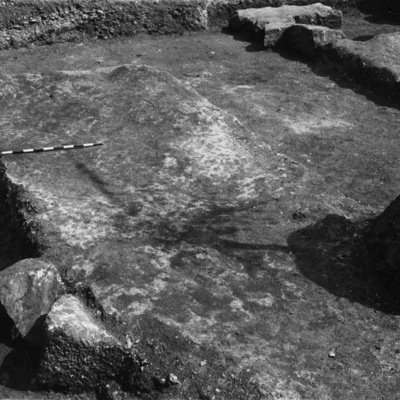 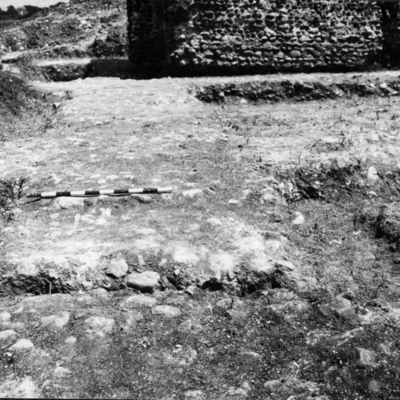 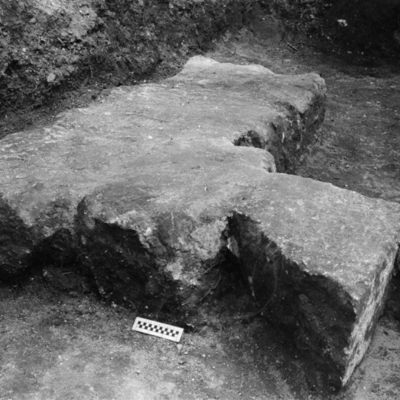 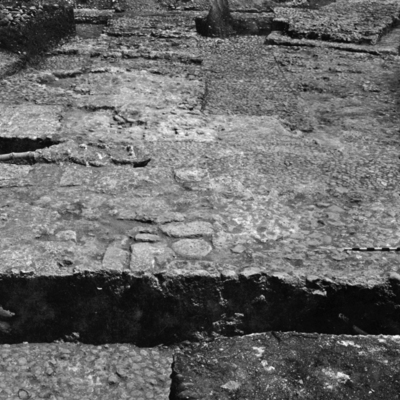 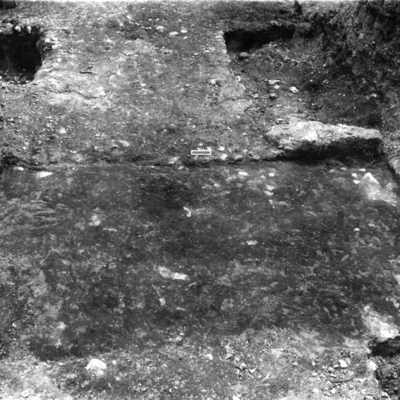 Foundations of ambulacrum showing imprint of masonry east of Stair 12. 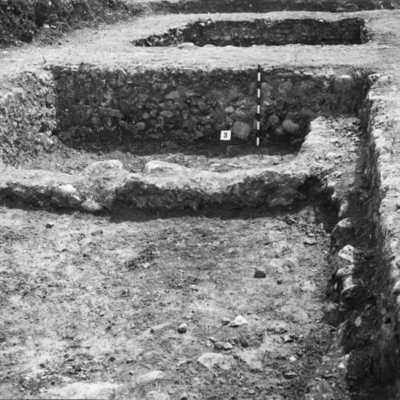 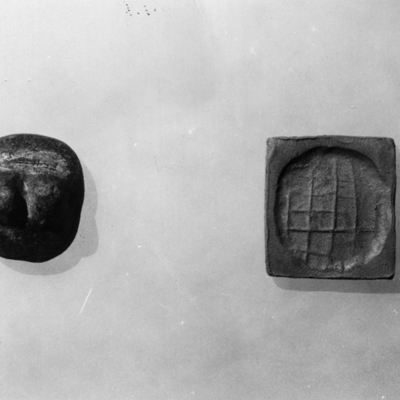 Foundations of ambulacrum showing imprint of masonry. 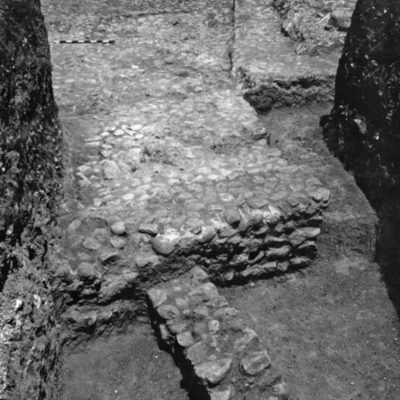 Rubble concrete base east of Stair 12. 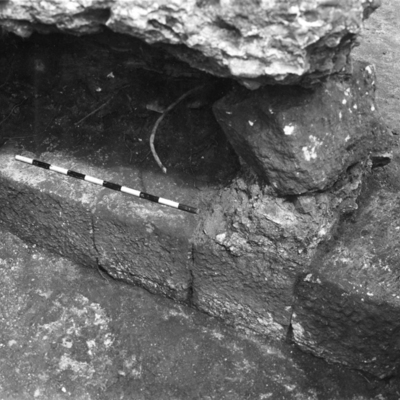 Detail of rubble in stratum beneath the rubble concrete of Stair 12. 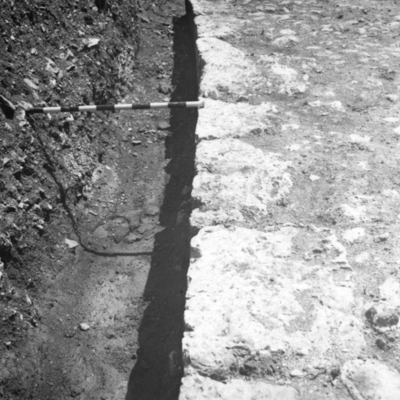 Detail of drain and strata over outer wall. 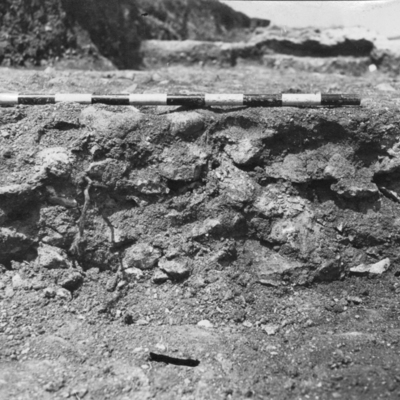 Limestone blocks on outer wall in situ. 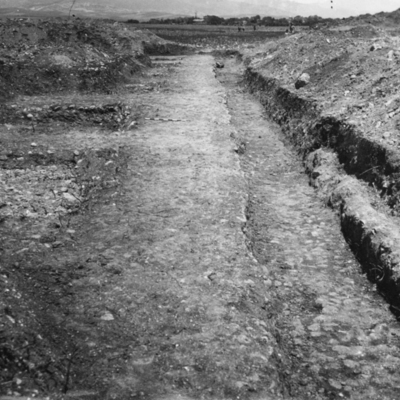 East road of porta triumphalis. 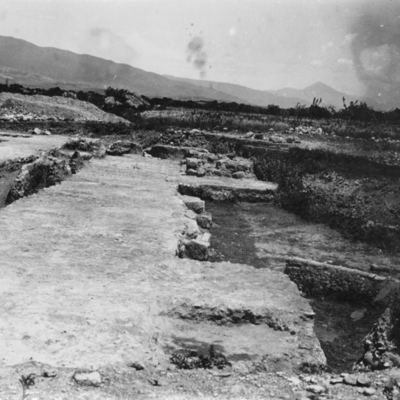 Center road of porta triumphalis. 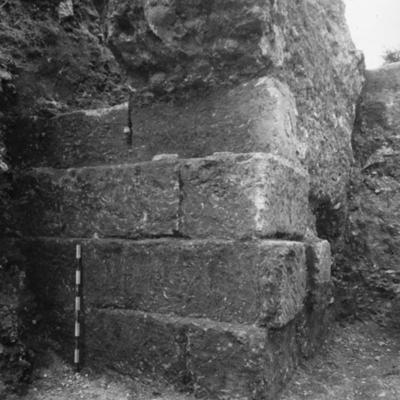 East face of stair to west of porta triumphalis. 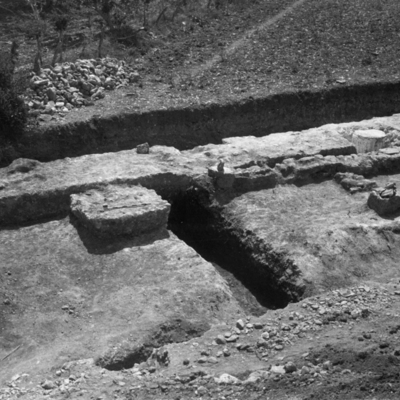 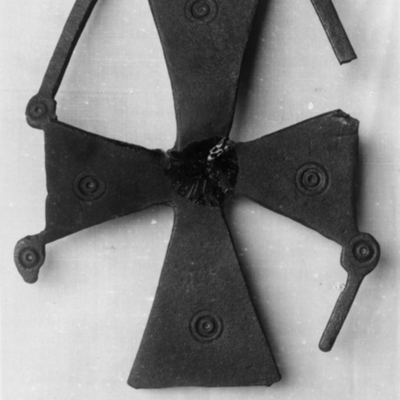 First course of ambulacrum in position southwest of Stair 14. 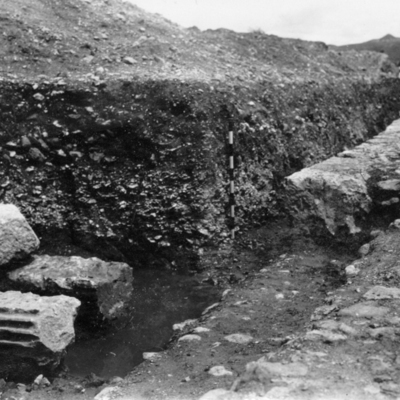 Drainage system along outer wall of Circus outside of porta triumphalis. 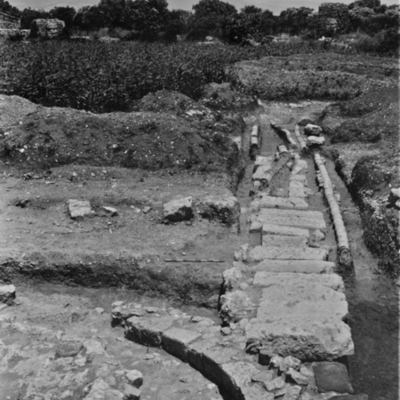 Section through E-W road outside porta triumphalis.